1:19 And what is the exceeding greatness of his power to us-ward who believe, according to the working of his mighty power. We are very much privileged to live and work out for the Lord sharing the Gospel and praying for the spread of the Gospel among our people nearby Bethel as we realized that this is the purpose of God to save us so to be His servants. There have been many fruits of the ministry of Bryce Homes leaders in Bethel area. Especially i could say that we have been blessed a lot spiritually when we see God working in the lives of the people. We could have a quarterly meeting for encouragement and prayers together. God blesses and added some new believers. And each of Bryce Homes leaders has his own vision for the Lord and tried our best but our goals are the same for His kingdom sake. We want to thank Roger and all donors for your hard works that help our families. We never forget to pray for you and this ministry. I just would like to write about Bryce Homes 4 and 9 as an update. Bryce Homes 4 and 9. Andrew and pastor Ling Khaw Ghe the leaders of BH 4 and 9 have sent me their report of how they are doing with the children they care. Their work of planting the yam seeds, star-shape-beans, coffe and some other platations at their compound with a view to self supporting is progressive and a new building is being constructed in Mindat town as attached pitures. Their sister Ling Pai also has returned home from her work in Singapore to help them in the ministry now. We see God's leading hands upon these two families for the people there whose lives were darkened. They said they are very much privileged to work this ministry under UTT and they are always praying for all. Thanks for your prayer support. We have many wonderful experiences in Delta area Christmas outreach trip from Dec. 1-11.By His grace we traveled to 8 villages in 4 Townships. We distributed more than 2000 "Are you a good person" tracts. In this trip we felt simply sharing the Gospel of Christ is not enough. So, we challenged them and warned them not to delay in making a decision. We saw a good response to the Word in those villages. We saw that this is a time of God opening their hearts to the Lord. During day time, we had the privledge of sharing the purpose of Christ's birth in 6 government schools and 1 preschool to a total of around 1,000 children. We also visited over 60 houses. Every night we had open air preaching and Jesus film show with projector. What these villages need is missionaries who would continue the work follow up. At present, Maupin Township is cared for by Bro. Luke. Wakhemah Township is overseen by Salaphan from Byryce Home 7 and his father from Bryce Home 10. Laputta township is overseen by Thar Neu of Bryce Home 8 and Myaungmya Township is overseen by missionary Khuasik supported by UTT. We carried rice to give out sometimes on foot, sometimes on boat, sometimes by bus and by taxi. Gabriel from Bryce Home 17 is better now. Now I will join Mindat trip to visit Bryce Home 4 and 9 this afternoon. Please keep on praying. I just would like to share with you about our mission trip to some areas of Tachilik and Tarley township, Shan state during last two weeks. We started our journey from Yangon on May 7th and back on 20th. It took us to get there two days and nights. We were very much privileged to teach and preach to several people mostly they are Akha and Lahu tribes as most young ones are addicts of drugs. We were four; Say Htoo Aye, Thar New, Khua Sik and Habakkuk. Firstly we spent three days and nights teaching in Tachilik at the Chin Baptist Church of which S K Lian is an assistant pastor. Some children about 9 to 13 in age plus 15 adults altogether 35 were taught about salvation and some small children were separately taught the Bible stories and Christian songs. 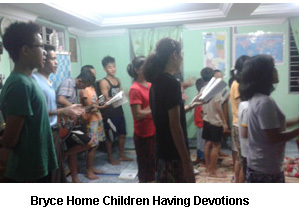 And we had visited the Bryce Home 11 (of SK Lian) having a prayer meeting and encouragement with the Word of God. And we went to Bethel village where some of our new Bryce Homes ( BH 12, 13, 14) are settled. We also had teaching program for two days there at Bethel church where Timothy TunTun (BH 12 leader) is a pastor. Phoebe (Timothy's wife) and Esther also have a plan to start the kindergarten program at the old church building for the villages nearby from June. 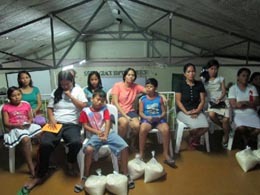 Alijuju (BH 13) and Daw Naca (BH 14) are also actively involved in the church activities. I met some of our friends Solomon's family and Moses' joining us in all programs. We also went to the place of Judah (BH 15) and our friend Mark where we had teaching for a day and night. Judah and Mark have a plan to do the mission work there in their place the boundary of Lao country. And Judah is now constructing his own house by himself as he had a good vision to start with helping the poor children for their education and at the completion of the house he will have the poor children stay with them and teach them about God's Word. We praise God for His guidance to have such a great privileges to get involved in the ministry. I just herewith attached some pictures. There was an inconvenience in the photos for virus, so I did not send some more pictures that I wanted to. We pray that He will continue to bless us for His Kingdom sake. Thank you for all prayer partners. I would like to give you a report thanking God for the unforgettable ministry opportunities we had during the past month of December 2014. From the beginning of the month, we had outreach ministry programs in 3 places in Yangon and in 13 unreached villages of Delta area. We also had house to house evangelism, distributed Gospel tracts, celebrated Christmas in a government school, several villages and introduced Jesus Christ to more than 3000 people. At the same time, these ministry activities strengthens and equips our team members to stand strong for the Lord. Sometime we went on foot, sometime by boat, and also by bus and motor bike. All this was made possible because of your prayer and financial support. May God renew our mind with His Word to be more like Him. Thank you for your prayer support. It means a lot to us. Last night we spent a great time at Lay Kai village where our friend Luke is doing a mission work. We sang Christmas song and shared the Gospel and prayed over for 20 families. Luke will continue to make follow-up with the Words. Tonight we sleep at the house of U Thein Win converted from strong Buddhist. At his house we gathered some new believers and gave encouragement with God's Words. After that we visit and share the Gospel again to 11 houses. Tomorrow we will go to Yelay Kyi village where is no internet connection. How are you doing? I hope and pray that your health is better. It is my great privilege to inform you about how the Lord works here in our place Lukpe village a remote area of Southern Chin in Myanmar. I felt it as a special call of God to our family. Since my elder brother Andrew ( BH 4 leader) has started to care for the poor children in Mindat with the help of UTT God continues to bless us and makes me to be a pastor of the local church that I have a good chance to serve the Lord. My wife and I have been blessed with a daughter and we live together with my parents. God is wonderfully working that the church now consists about 30 people apart from children. As we teach the government curriculum at our house almost all of the children are allowed by their parents that we also teach the word of God while some Buddhist monks are always trying to persuade them in many ways like conducting free tuition in places. We now have some people joining us in the church as attached. I would like to extend my thanks to all our sponsors for your love for God for which we could involve in the ministry. 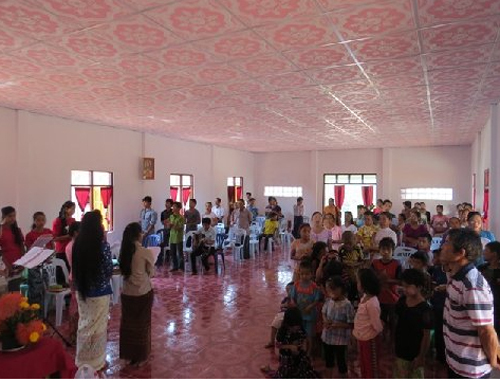 As some of them have confessed to believe Jesus Christ now we have a church building and normally about 40 people attend the church. I just herewith attached pictures of our family (BH9), our Sunday school children, and church members. Please continue to keep us in your prayers. Human words are not complete to express my heartfelt thanks to you for your help to begin this great and important ministry in our place. The ministry of caring for the children enables me to proceed my vision that is sharing about God being the creator of all and about His love for all human beings regardless of what and how we are as I practically do now among our people who are mostly animists. 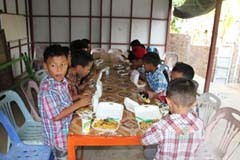 Through this ministry many poor and orphanage children have been taken care of their food, housing, clothes, education. Therefore, we have a good chance to share the Gospel to their parents and some other parents are also interested in how we care. We take the children ( of BH4) to their villages during holidays helping their parents to work and share about God and pray for them. We praise God for His protection and providences that we could have a church building a good place meet all the believers in prayer and praises. I hope and pray that God will continue His work through us regardless the critical situation among our people for the extension of His kingdom. I would also like to thank all donors for this ministry for all their love and helps which is the only means to our success in the ministry. It is my privilege to write about how Bryce Home Five has been doing. 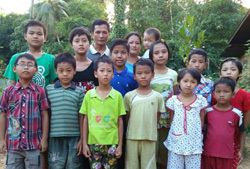 We praise God for the numerous blessings that BH 5 family in Myanmar enjoys thus far. At the same time we want to thank all our sponsors for their help that makes us afford for house rent, clothes, foods, educational needs and all daily needs. Two of our children Myo Naing and Ruth are studying Grade 8, Lawm Pui Grade 7, Lal Din (Hniangmang) Grade 6, the four Rebecca, Ngwa Lay, Cung Nawl and Esther Cho are Grade 5, Cung Nei Thang and Lal Cung Nung Grade 4, Ezra Grade 2 and Lal Hruai Tluang the youngest studies Grade 1 etc. We try our level best to train them and so are they improved in their learning. As we have a Sunday school program Van Aye (my niece) also helps teaching Bible stories and songs every week. Now they could recite all the Bible key verses and get the books of the whole Bible by heart . And we have a prayer meeting every evening. I just herewith attached some of our picture just to show off how the Lord cares and provides. Thank you all of you for your love and care. God bless all for His name sake. I write this note with thanks giving for His blessings, protection and guidance through out the years. I also would like to express my heart felt thanks to every one who get involve to support Myanmar Bryce Homes ministry. Through which we have great privilege of caring and training the children to be strong Christian. I have confidence in God that all they have heard and learned will keep them not to be led astray from the truth about God's Word. 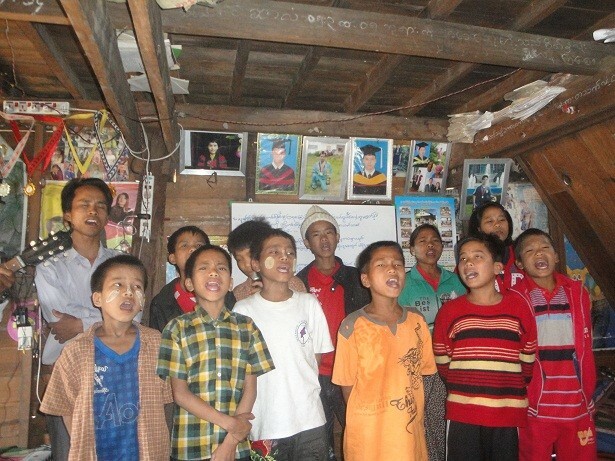 Now, Shwe Oo who got a skin disease who had no hope at the beginning becomes a Sunday School teacher and their family is called Bryce Home 6. Hnemte a good helper of Bryce home 3 once becomes Bryce Home 7. With her husband Salaphan they serve the Lord at Shwelinpan. Daniel and Mama have graduated high School. They are gifted in Computer and Mobile soft ware and service. So, they have a project and pray to open computer and mobile sale and service centre. Muana, Donga, and Lydia Malsawmi are no longer resident at Bryce Home 3. Muana studies at Pharmacy University, Donga studies Biblical School of Theology and Malsawmi at Education University. Including these there are 20 children at Bryce Home 3. Puite, Nenawi and Rodi are Grade 11( high school final board exam). Enny is Grade 10. Christopher, Sumpi, Nawmai(new one), Sarah and Hming sangi are Grade 8. Humte and Nathan are in Grade 7. Ma Chhuani and Val Thawm are Grade 4 and Duhte is Grade 1. These 3 are new ones. And Joshua my son is K5. Words can not express how much we are thankful to Roger, Tom, Sowing Circle members and every one who involved to support BH3. We pray God to continue to keep you to stand strong with us in the ministry for His glory. very good foundational part of Christian mission. keep you all in our prayers every day. It is my privilege to inform you about the ministry in Mindat township during last week 12-19 of March. We were three, Thar New, Sumpi and Habakkuk. We went to Mindat and Lukpe village to oversee Bryce Home 4 of Andrew in Midat and potential Bryce Home 9 of pastor Ling Khaw Ghe in Lukpe village. Pastor Ling Khaw Ghe is a younger brother of Andrew and Lukpe village is their native place. As we departed from Yangon on 12 by the evening at 4:30 the whole night we arrived there in Mindat on 13 by the evening we spent one day (Friday) with Bryce 4 family. In the evening, together with Bryce Home 4 family we went to Lukpe village where Bryce Home 9 ( of Pastor Ling Khaw Ghe) is there. We spent times for three days and three nights there in Lukpe. We have a good times there at nights in preaching and daytime in teaching as they had thanksgiving service program. The father of Andrew and Ling Khaw Ghe offered an animal to provide food and invited all the people in their village and the nearby ones both the Christians and Animists. We praise God that He has revealed about His Deity and Works to those who came to the feast as they all attended in the program. God uses this family to spread the Good News of Jesus as they were converts from animist background. We hope and pray that God will give us more chance to minister His Word to this people in the future too as He has obviously revealed His plan and will for them through you and us with some of His servants there in the place. Please pray with us that Lukpe local church member are in the process of building the church with wood and they have been working very hard, cutting the Big timber and sawing the wood for the building. They have a plot for the building. The Bryce Home 4 children are so lovely and developed in many areas compared to their previous situation. We see the potentiality in them to be light to their people. The leader ( Andrew) is also very active and disciplinary to care for the children. They bought six bags of Yum seeds to grow and also they are willing to raise goats which he said can make benefits. May all glory be of God. We have all 10 reports posted. This 10th report is the final report for this trip to Myanmar in February 2014. I think you will be blessed to read these reports that Roger has sent! Roger is at home now with his family! Please scroll down to read all of the reports. I am writing this last Myanmar report as I fly between Tokyo and San Francisco. It will be good to arrive home and see my wife Myrna and my daughter Angela and her family. My last report was much longer than usual and focused on the difficult and unusual day I had before leaving Myanmar. My brief stopover in Bangkok was not nearly so eventful even though there were riots happening around the city protesting the government of Thailand. A group of over 1000 farmers had driven their tractors and trucks to the airport from where I left Bangkok, but there was no problem. The previous day five were killed nearby the hotel where I was staying. Living in the western world essentially isolates us from the many difficulties that my friends in Myanmar face every day. We complain when we think we are having a difficult time although few of us have ever missed a meal or gone to bed hungry. We sleep on comfortable beds and have no idea what it is like to stretch out on a hard floor with nothing but a bamboo mat for a cushion. Our toilets are of the indoor variety, and water is used in abundance for flushing and showering. Our acquaintances in Myanmar never complain although they often suffer from malaria or other diseases that are related to poor sanitation. The majority of the children we care for have come to Yangon from villages where living conditions are far more difficult than Yangon. The testimonies they shared indicated how grateful they were to have their needs taken care of as well as the chance they have been given to have an education, which they would never have been able to get without help from the Bryce Homes Program. For those of you who are assisting Understand The Times by sponsoring a child in Myanmar or helping us with our other expenses, I have a message for you from each child. If you could see the tears of gratitude that I saw, your hearts would be melted. You would know that the investment you are making in a young life is paying great dividends for the future for our world and more specifically Christianity. Several shared they wanted to pursue a profession or attend a Bible School where they can learn how to teach the Bible and share the gospel with the lost. The Bryce Homes Program has advanced through various phases since the idea was first put into action in 2006. Instead of the idea of organized institutions for the poor, we have redirected our vision by establishing Christian homes where parents can provide an environment for the needy as well as become faith-building lighthouses where truth can be spread to the surrounding community. These families are encouraged to take in orphans or children from poor families and make them part of their own families. With our help and the spiritual leadership of our team, they are able to provide food, clothes, and education for their extended families. My vision to change the Bryce Lodge Program originally established in Myanmar came as the result of visiting the Philippines, Kenya, and South Africa. Pastors in all three countries were chosen to implement and oversee the Bryce Homes Programs as part of their church outreach ministries. As this program worked well, we decided to move in the same direction in Myanmar. This time, while in Yangon, I spent quite a bit of time discussing with our leaders the possible direction for our program in the future. Like the other countries where we are working, the needs are endless and sometimes one can be left with a feeling of hopelessness. What else can we do to meet more needs and how should this be done as the Lord provides? This is the question I have been asking the Lord to show me the answer and as well to give me the wisdom to know how to move ahead. The last thing I want to do is to over extend our resources by making promises that cannot be met in the long run. Another task for the future is to find ways that we can be introducing our Bryce Homes to learn what it means to have a work ethic. Until now, finding work to become self-sufficient has not been possible. As the country is changing, so too are the horizons expanding with new opportunities. We want to be on the leading edge to help our Bryce Homes become training centers for educating this new generation. There are four more Bryce Homes that we could add to our program in the immediate future. 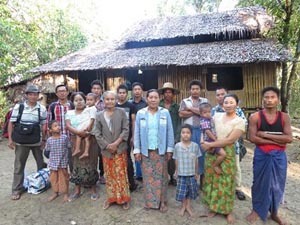 As these families are Burmese people who can live in the dwellings they already own, our costs to support these families will be greatly reduced. It will cost only hundreds of dollars per quarter rather than thousands of dollars. Already since sending out these reports from Myanmar on this trip, a number have caught the vision and are now contributing to the Myanmar Program. By faith, we believe God wants us to move ahead as our support grows. This trip has been a tremendous blessing for me personally. As I see the children grow up and mature, I can now see how they will be ambassadors for the Lord in the near future. Also, I am anticipating the addition of new and younger children as the older ones move on. Perhaps some of the older ones, once they graduate and marry and have their own families will become the next generation Bryce Homes in Myanmar. Bryce Homes Myanmar has been one of the many blessings I have experienced in life. May the Lord continue to direct us in the future as we continue to serve Him in Myanmar and around the world. I have travelled all over the world and had countless unusual experiences. Especially with my good friend Fred Lutsenko. We visited many places throughout the former Soviet Union after its collapse. At this stage in my life, I thought my wild adventures were behind me; however, on my second to the last day in Yangon circumstances unfolded for another “believe it or not” chapter in the history of my life. While I can laugh now, as I write about this report, it was no laughing matter as the events that I am about to describe unfolded. I think that God laughed, a little, knowing that He was going to work it all out. As mentioned in a previous report, my last full day in Yangon was spent visiting Bryce Homes One and Two and the small telephone accessories business set up by the Bryce Home Two leaders. The schedule started by visiting Bryce Home Two. After being at Bryce Home Two, for about one hour, Mang sent two of the older boys, by bicycle, to find a taxi that would take us to the telephone shop and then on to Bryce Home One. The taxi arrived and we got in. Mang and his wife were in the back seat, and I was in the front along with the driver. Immediately I noticed three things different about the taxi. It was smaller than any taxi I had ridden in before. It was dark green in color and the driver’s wheel was on the left side of the car. This is the same as the cars in North America. This was very unusual as every taxi I had ever ridden in before, in the 8 years of travel throughout Yangon, the driver steered from the right side. We arrived at the site where the telephone shop was located and got out of the car. I had my camera around my neck as I had not put it in my case after leaving Bryce Home Two. When I asked where my carry-on case was Mang said it was in the car with the driver as we were only staying for a few minutes and we would use this same driver to take us to Bryce Home One. I took several photos and we got back into the car and took off in a hurry. It took only a few minutes to get to Bryce Home One and once there we piled out of the car. Still holding my camera in my hands the children immediately ran to the taxi to greet me. We went into the house and the children continued to shake my hand greeting me in English. Mang and his wife sat down and the program started. The children sang, recited verses from the Bible, and shared testimonies. After about one hour had gone by we went outdoors to take individual photos and a group picture. Mang handed me the list of the children, which included their grades and ages. I needed this list to put in my carry-on case. When I asked him where the carry-on case was, there was a sudden shocked look on his face. When Mang’s wife started speaking in Burmese, much faster and louder than normal, I knew the answer to my question. My bag was left behind the seat in the small taxi that brought us from Bryce Home Two, via the telephone shop, to Bryce Home One. When I inquired of Mang how we were going to get the driver to come back with my bag, he just kept muttering in Burmese, and then in English he repeated several times – “oh no, no! I am pretty sure that I said more than oh, no, no! I was horrified. My bag always sits next to me or the passenger in the back seat. Because the car was so small, there was no room for a bag and two passengers in the back seat. For this reason, it was put behind the seat, and in the excitement that occurred when we arrived to see the children in Bryce Home One, the bag was completely forgotten. Now panic set in. We did not know how to locate the taxi driver. There are thousands of taxis in Yangon in a city of a population of over six million people. Taxis move from place to place as people flag them down. What were the chances of locating the driver and finding my bag? Worse yet, what the bag contained was the problem. My USA passport and my Canadian passport as well as my computer and Bible that I have had for 35 years were in there. For a moment, I wondered how I would be able to get out of the country of Myanmar and make the journey home. If you have never been in a situation like this it may be hard to imagine the thoughts and feelings that were spinning through my mind. Let me tell you, you will never want to have this experience. Mang suggested we go back to the location where the boys hired the taxi and see if anyone knew the driver and how to get in touch with him. We did but our efforts were futile. While I could not understand the language, I could understand what heads shaking sideways meant. No one knew anything. Someone suggested we take a taxi to the nearest traffic police station that was about one mile away. We called another taxi and went there. Mang explained what had happened and there were more heads shaking from side to side. The chief officer in this location suggested that we go to the main police station in the Yangon division of Insain that was about five miles away. We hired another taxi and headed for the station. As soon as we walked in the building, I saw dozens of police men and police women. Some of them were sitting in front of huge piles of paperwork and seemed very busy. As I was obviously a foreigner, one officer wanted to know what I was doing there. Mang explained to him what had happened. The officer immediately beckoned to us to follow him and he flagged down another taxi. Mang encouraged me by letting me know that the officer who was with us had ways of finding out information that may help track down the driver. When we arrived at the site where our runaway taxi was first located, the officer immediately began questioning everyone around the location. There was more chatter and a shaking of heads in a negative way. It was time to pray again. Then the officer, who had brought us from the police station, called for a detective. The detective arrived on a motorbike and asked more questions and took notes. The crowd around us continued to grow as more and more people were gathering wondering what was going on. Finally, there was a breakthrough. Someone, who stopped by to see what the problem was, knew about the green taxi with the steering wheel on the wrong side. Actually, he did not know the driver but he knew someone who was a friend of the driver. He ran off to see if he could find this person but came back shaking his head negatively. Apparently, the friend was not home. However, he had the phone number of another friend of the taxi driver who had my case and called him to see if he could track him down. By now, it was dark. I started to think about what I would have to do in order to get out of Myanmar and home. And then a miracle happened. Suddenly the group that had gathered around us started pointing and shouting. Out of nowhere appeared a small green taxi. The driver jumped out of the left side of the car. He popped open the back hatch and there was my case with absolutely everything inside just the way it was when we left it behind. I hugged the driver and the officer who had been assisting us for over three hours. But this was not the end. We had to all to go down to the police station to file a report and take photos and ensure the policeman and the detective that nothing had been stolen. I would like to say that the rest of my day finished well but this is not the case. What happened next added more drama to one of the most unique days of my life. As it was approaching eight o’clock at night, I was completely exhausted. Mang was in a hurry to get me back to my hotel so that I could rest before departing Yangon in the morning. He flagged down a taxi that was parked near the police station and arranged a price for the trip. Mang insisted that he ride with me, in the taxi to the hotel, but I told him that was not necessary as long as the driver knew where I was to go and that the price to take me there was set. I got in the cab, this time with my case on my lap, and I strapped myself in. This taxi was also unique. Physically, it was a wreck and the door would not shut. Worse yet, there was a smell of gas that made me choke. Mang asked me again if I would be OK, and I told him to go home and I would see him in the morning when we met at the hotel to go to the airport on my way home. Mang had not been gone more than a minute when the taxi cab driver started to speak to me – in Burmese. “I am sorry,” I said, “I don’t speak Burmese.” After a few minutes, I finally figured what he was telling me, or should I say asking me. He wanted to know where he was supposed to take me. Thankfully, I had my room key with me with the name of the hotel. The only problem was he did not read English. After cranking the motor over for several seconds, the car finally started. Not only were the gas fumes giving me a severe headache, his car did not have a muffler and the noise was unbearable. Nevertheless, we were off—where to, I wasn’t sure. We traveled for about half an hour when I started to be concerned. There was not a single street or building that looked familiar to me. While I would never drive in Yangon, I am at least somewhat familiar with the main streets back and forth to where my hotel is located. Just when I was about to close my eyes in the taxi, the driver suddenly pulled over in an unlit area and started yelling. A group of Burmese men approached the car. The driver indicated he wanted my hotel card and I handed it to one of the men. They chatted back and forth and off we went in a different direction. Now I knew I was in trouble again. How could all these things be happening to me all in one day?! After about another 20 minutes, I saw something in the distance that gave me hope. The Buddhist Shwendagon Pagoda is lit up at night and can be seen for miles in Yangon. We were headed in that direction and my hotel was within a mile or two. At least he was headed in the right direction. Just when my confidence was building, his car started to sputter and jerk and then it stopped completely. Three or four more cranks of the starter and away we went. About one block or so later the driver pulled sharply into a gas station and the car quit entirely. What happened next was the final straw. The driver reached down beside my leg on my side of the front seat and untied a one-gallon jug. He unscrewed the cap, pulled out a rubber hose, and handed the jug to the gas attendant. I was not sure if what I was seeing was for real. A couple of minutes later the gas station attendant handed the jug back to him full of gas and he pushed the hose back in the jug, screwed on the lid, and tied the jug back to the console with a bungee cord. Now I knew why the gas fumes were so strong and why I was getting sick. If only I could speak Burmese, I thought. I would get out of this car and find another taxi in order to get back to my hotel alive. To make matters worse the traffic the rest of the way was stop and go, bumper to bumper. I wondered if we would run out of gas. I kept looking for gas stations along the way. On one of the many stops, he flagged someone down who was selling cigarettes. Without a word of Burmese, I was able to communicate to him that I was allergic to cigarette smoke pointing to the gas tank on my side of the front seat. Finally, we arrived at the hotel. I don’t know what price Mang had settled for the driver so I paid him generously. As I was writing this, it is as if I had a bad dream. Thank God, all is well as I write this from my hotel in Bangkok. Tomorrow I will be headed home. On the way, I will try to summarize some things I have learned on this trip and share some ideas where I believe God is leading us in the future. My schedule for the day before leaving Myanmar for home involved visiting both Bryce Homes One and Two as well as a brief visit to the small telephone accessory business set up near Bryce Home Two nearby where they live. 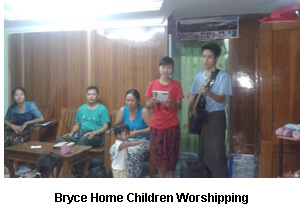 Bryce Home One was established in 2006 under the leadership of Pastor Mang and his wife as well as house leaders Siang and his wife. They have been leaders of this home ever since the beginning. We have since added the name John Kantorak House in order to honor the memory of one of our former UTT Board members and good friend. 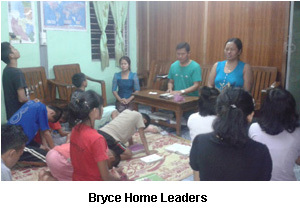 Bryce Home Two was established the following year in 2007 also overseen by Pastor Mang and his son and daughter-in-law. 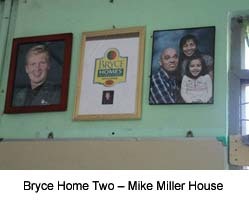 Bryce Home Two is also called the Mike Miller House. Mike, who was born with cerebral palsy, is married to Becky and has a daughter Irene. In the year 2007 Mike took it upon himself to raise and entire years support so that we could expand the Bryce Homes Program in Myanmar. He and Becky now head up our Bryce Homes Philippines Program where we have established an additional seven more Bryce Homes. So it always gives me great pleasure to visit Bryce Home One and Two to tell the children this is where the Bryce Home program started. We now have 38 Homes in four countries with the vision to expand as funds are provided. In the month of March I will be visiting Kenya were there are 20 more Homes, sixteen of them are widows with orphaned children. As each country varies with their problems and needs, we try to be flexible in how we administer the programs. In Kenya, instead of renting homes, we have been building new shelters that replace shacks made of mud and grass that have deteriorated. We have also constructed outdoor latrines to help improve the terrible sanitation conditions. Our leaders in Kenya are mature pastors and church leaders who we have grown to appreciate, more and more, for their diligence in implementing the program. In South Africa, in the poor areas of the city of Durban, we have established 5 Bryce Homes. David Meisner and his wife Krista oversee this program. Dave also pastors a church and they both have an extensive ministry to the community. In the future, as God leads us, we are open to expanding the program, even to other countries. Bryce Home One and Two are only separated by a few miles so it was easy to visit both of them in one afternoon. In each location the children sang songs they had prepared as well as recited numerous scriptures. Keyboards were donated to all of the Bryce Homes in Yangon by friends of mine who travelled to Myanmar with me and saw the ministry in action. Now several of the older boys have learned to play the keyboard and are even writing Christian songs. Children in both homes spontaneously shared their testimonies and gave thanks for how their lives had been transformed. Tears flowed down their cheeks revealing to me how genuine they were. If only their sponsors could see this for themselves, I thought. I fought back my own tears thinking how all of this was initiated through the grief and pain our family experienced when we lost our son (brother) Bryce at a young age of twenty-seven. Following the visit to Bryce Home Two we went to the telephone accessory business. This business was established as a means for Bryce Home Two to find part time work for the older children. This, also, helps them to learn the basics of business. So far, after about one full year, this business is breaking even. The small sales shop is just a short distance off a busy street and draws customers who are passing by. This is also a perfect way to be a witness to the Buddhists in the surrounding area. In my next report I am going to tell you about the rest of my day in Yangon and how Mang and I made two visits to the Yangon Police Station during a four hour period. Please don’t panic. While it was a frightening experience everything is fine now and I have an experience to tell my grandchildren they will never forget. This report is about my visit to Bryce Home Five and also about the meeting I had with Andrew, who is our Bryce Home Four leader in the village of Mindat in Southern Chin State. 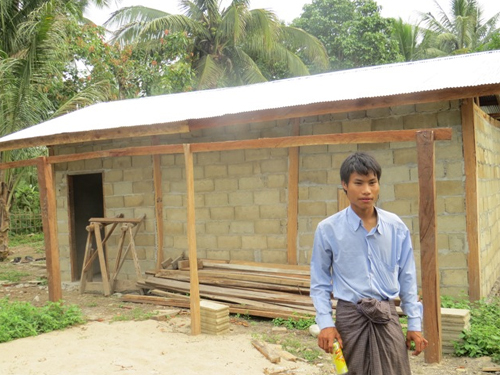 Early in our Myanmar Bryce Homes Program, I believe the Lord gave me the idea to add an additional name for each home, either in memory of a friend who had passed away or for an individual or group who has partnered with us in financial support. Bryce Home Five is also called Grant Undershute House in memory of my wife’s brother who passed away from cancer. Bryce Home Four has been named the Gary Turnbull House in memory of a very good friend of mine. As time goes by, we will name the other homes in Myanmar in the same way. First, a few words about Andrew. He has a wife and three children of his own. He has a heart to reach out and assist the very poor children in the area by teaching them about Christianity and helping them to go to school while providing for their basic needs of life. 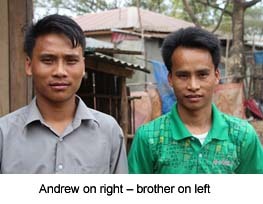 I first met Andrew when he was attending Bible School in Yangon about six years ago. His entire family are converts from nature worship and are now Christian leaders. 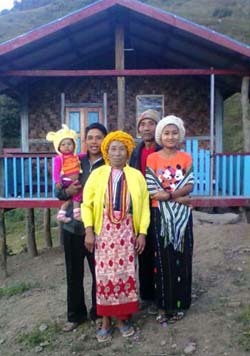 Andrew’s brother and his wife will become leaders of another Bryce Home we will soon be establishing in Chin state. Andrew’s brother is a pastor and has a gift for teaching young children the Bible. This is critically important in the Mindat area where Buddhists are recruiting children and taking them to Yangon to train them to become young monks in monasteries. The cost of supporting a Bryce Home in this remote area is a fraction of what it costs in Yangon. UTT does not have to pay the cost of rent for homes as we do in Yangon. Rather than find individual sponsors for each child in the Homes we are adding, we will be functioning the same way we are doing in Kenya and allot a certain amount each month to provide food, clothing and education. Our leaders are all solid Bible-believing Christians who have the ability to lead and teach. In this way, we can reach out to a dark country with light shining from each young believer. Andrew brought me individual photos of the children and a group photo. A few years ago, we assisted him to add on to his bamboo house so that he would have plenty of room for the additional 10 children he has added to his home. This year before he left for the long two day ride by bus back home I gave him the funds to purchase seed so that his children will be able to plant a crop of yams (sweet potatoes). This will give the children in Bryce Home Four some work to till the ground and reap the benefits of their work. The $100 we provided for seed should more than double in profit when harvest comes. We are encouraging all of our Bryce Homes to assist in becoming self-sufficient, even if it happens in small stages. I have known Habakkuk and his wife for over six years. He also originates from Chin State. He is also a graduate from a Bible College and is a diligent teacher of the Word of God. He and his wife have two of their own children and they have taken in eleven more. 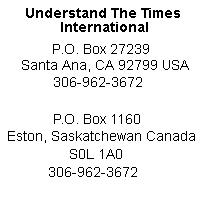 UTT provides $30 per month by way of sponsors who send support to UTT by check or Paypal. Above that UTT provides for the cost of renting a home in Yangon which ranges from $200 to $250 per month. The rent must be paid one year in advance which we take from our general funds. Unfortunately as Myanmar is advancing in the technological age, so is the annual rent. While we have never appealed to our supporters, this is an expense that we do need help with. Further, support is required for the living expenses of our leaders. Each home has a married couple and one helper. This amounts to another several hundred dollars per home that comes out of our general funds. I am reluctant to present these details as I do not want to leave the impression that we are appealing for funds. 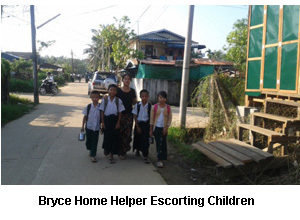 People around the world have generously given to our Bryce Homes Program in Myanmar and for this we are very grateful. However, some have asked how we can afford to operate with so many children for only $360 per child per year. I am presenting the whole picture in order to answer that question. The children in Bryce Home Five are somewhat younger than the other Bryce Homes but they are not any less talented. Their ability to recite the Bible is amazing, even the little ones. When I return from this trip I will have our webmaster post songs that I heard from each home so you can see and hear for yourself the amazing work of God in the midst of a country where the population is over 95% Buddhist. It is Sunday afternoon and all the people, of the Bryce Homes in the Yangon area, have gathered together for a joint meeting. A large church facility was made available to us for a small amount of rent and the children and leaders were transported there via truck taxis. The program began at three in the afternoon after everyone had arrived. Pastor Mang led the meeting and opened with prayer and the reading of Psalms 138. Bryce Homes One, Two, Three and Five participated in the programs. They sang and recited scripture. I recorded a number of the musical items that we will later post on our website. This way our Bryce Homes supporters can hear and see for themselves the work that the Lord has accomplished, here in Myanmar, since 2006. Following this portion of the program I was asked to address the gathering. As there were two other Bryce Homes represented, I introduced them first. Andrew, leader of Bryce Home Four, had come to Yangon from Mindat City in southern Chin State. That is a two day (day and night) trip by bus. 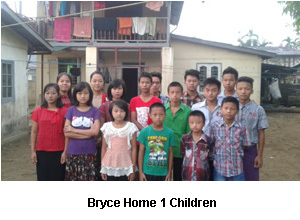 Bryce Home Four is in a very remote area of Myanmar. Many of the children come out of families who are involved in animist worship. The children have converted to Christianity through Andrew’s ministry. We are praying about establishing an additional Bryce Home in the same area that would be headed up by Andrew’s brother and family. Andrew’s brother is a pastor in village 12 miles away from Mindat. Bryce Home Six was represented by Shwe Oo. She is the young lady that we have been providing healthcare for since 2007. She suffered from a severe skin disease as the result of malnutrition as a child. She was originally a member of Bryce Home Three but has now has moved back with her family and teaches the Bible to the children in the Buddhist area surrounding the Shewilipan Church. Shwe Oo is an amazing young lady. Because of her illness, as a child, she was not able to attend school and was not able to read or write. I still recall her appearance when I first met her in 2007, her body devastated with scars. The following year, when Bryce Home Three was established, I encouraged Elisha to ask if Shwe Oo to be one of the children in the program. As soon as she started to receive proper nutrition there was an immediate improvement in her health. As well she was able to learn to read and write. Now she has a tremendous ability to memorize scripture – not just verses of the Bible but entire chapters including the Sermon on the Mount. 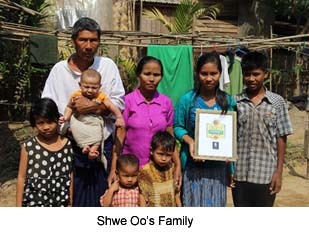 Shwe Oo now lives with her family and she and her family attend Elisha’s church. They act as missionaries to the Buddhist community around the church. My message to the children was focused on encouraging them to be strong believers in Christ based on 2 Timothy chapter two, verses 1-6. Following the message we went outdoors and took a group photo. While the 13 children from Mindat in Bryce Home four were missing from the photo, you can see how our program has expanded from our first Home with 18 children to where it is today. Finally, it was time for refreshments which we were able to provide for everyone. Following the meal the children jumped back into the truck taxis that were waiting for them and then headed back to their various locations. My next report will cover my visit to Bryce Home Five. Sunday was a long day for me in Yangon. Sunday morning I spoke at the Shewlipan Church that is pastored by our Bryce Home Three leader, Elisha. Halfway there I realized that I had forgotten the battery for my camera that was still charging in my hotel room. We had to turn around and go back to the hotel. This added an additional hour to the trip. When I arrived at the church the congregation was still singing worship songs. You could hear their voices from several blocks away. 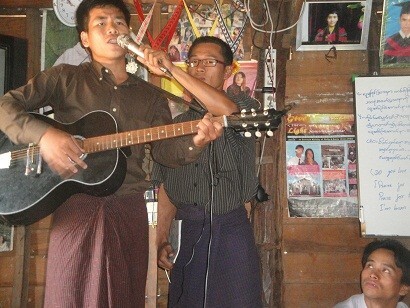 Burmese Christians worship very enthusiastically. 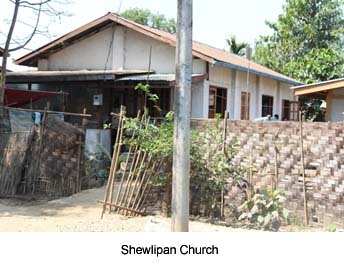 The Shewlipan Church, where our seminar Creation meetings were held, lies at the outskirts of Yangon in the heart of a Buddhist community. 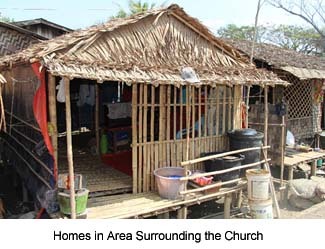 While there are regions in this area where other new buildings are being constructed, the dwellings all around the church are huts or shelters constructed out of bamboo and thatched roofs. Elisha and his team have an outreach ministry to this area. The church was filled to overflowing when I arrived. After setting up my projector and computer we were able to start. The morning service, in spite of the extended worship service, lasted another three hours. Adults filled the chairs and the children sat on the floor near the front of the church. Their faces showed their great interest in the information which gave me the energy needed to share the message. It has been some time since I have given a seminar on the topic of Biblical creation. However there was no question that God enabled me to speak out boldly. The importance of proclaiming the message of Jesus Christ as Creator in Myanmar is a great way to lay the foundation for the gospel. Following the service everyone in the congregation stayed for a meal and fellowshipped together. It was like I was experiencing a replication of the early church as recorded in the Book of Acts. The students who were in attendance from the UTT Discipleship School all expressed their desire to use the information they had learned as tools for evangelism to reach out to Buddhist friends and acquaintances in their surrounding communities. I was speaking to a small group of believers, halfway around the world, who want to know more about the biblical account of origins. They can be better witnesses for Jesus Christ and that is very rewarding. The trend in North America, over the past decade, seems to be going in exactly the opposite direction. So-called Christian seminaries or colleges either ignore the Genesis account or make the claim that it is nothing more than a Babylonian myth. Those who promote church growth seem to have taken the position that creation is offensive to those who are “seeker-friendly” and/or “purpose-driven. Other churches and pastors who once were willing to take a stance and promote biblical creation have now become silent because it is not popular with the postmodern generation. Perhaps it is time to go where God’s people want to hear the truth so they can be equipped to reach out and share with the lost. Following my morning session at the Creation Seminar at the Discipleship School we spent most of the afternoon visiting Bryce Home three. 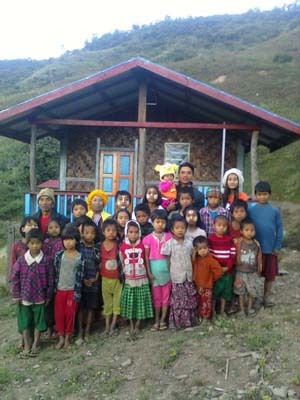 The majority of the children, that we are providing care for, are from Buddhist families. Not all of them have parents. Several are orphans. I have followed the growth and development of Bryce Home three for six years. The fruit that has been born is truly amazing. At first the children had no concept of Christianity and their behavior was a problem as they did not understand discipline. Now all of them are attending school and doing extremely well. Mauna, age 19, has completed the second year of medical college and last semester received five distinctions in his classes. Daniel, also age 19, has become a self-learned computer expert and has his own vision to set up a business where he can train others. 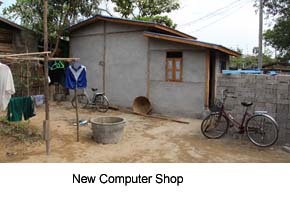 When we started the Bryce Homes Program very few people in Myanmar had access to computer technology. Now that changes have occurred Myanmar is rapidly moving ahead in the technology age. The group sang several songs and then recited scripture. Christina, Elisha’s wife is an incredibly gifted teacher. Five of the Bryce Homes Three residents are able to recite the entire Sermon of the Mount by memory. As the sun was beginning to go down it was time to call a taxi and make the trip back to my hotel. Traveling in Yangon during rush hour is an experience that can never be forgotten. Finally we arrived and it was time to have something to eat and then collapse in bed for the evening. First let me set the record straight. I am in Yangon and not Manila. I have not been mugged and did not have my wallet and passport stolen. I am not in need of funds sent to me in order to be released from my hotel. If you wonder why I am writing this it is because my AOL personal e-mail account was accessed and everyone on my AOL personal mailing list received a fraudulent plea to send funds to help me out immediately. I hope no one fell for this scam. It is the same plea I have personally received from others who have had the misfortune of having their e-mail account hacked. Everything is going well here. Yesterday we had two lengthy classes at our UTT School of Discipleship. The meetings were well attended by students, missionaries and our Bryce Homes children from Bryce Home Three who are soon to graduate from High School. The topics laid the foundation for the next two days dealing with the topic of Creation versus Evolution. In Myanmar, where the population is over 95% Buddhist and they are primarily evolutionist, this topic is of vital importance. My translator was excellent and we were able to move quickly and cover a lot of ground. At noon we stopped for a break and all the attendees were given a meal consisting of rice with chicken hash soup and spice. After the meal was over Elisha showed me the new building that has been constructed on the Shwelinpan Church property that will be the center for computer education and a photocopying business. A few years ago we had purchased a rice field a long distance away from Yangon that we thought would be a good source to supply work, income and food for our program. As it was not working out Tom Worthington and I decided to sell the property and provide some capital for our four Bryce Homes in Yangon. Elisha developed a computer education center and a photocopier servicing business which is very timely. One of the boys, that Elisha and his wife Christina have nurtured for the past six years, has the ability to set up and run this business. Elisha and friends constructed the building out of bricks and plaster and the business is now ready to go. Elisha also showed me the pile of bricks that had been manufactured by the School of Discipleship students. When I saw how this was done and how useful these bricks are, for various construction projects, I was very excited and impressed. This is a way for them to become more self-sufficient. This is something we have been praying about for years. This may be a small industry that we can establish in Kenya for our Bryce Homes. We will pray and ask the Lord to show us how to proceed. 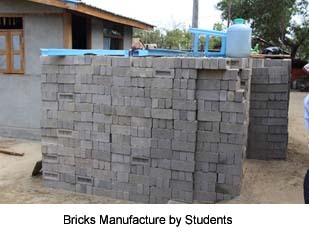 While constructing latrines, recently in Kenya, we discovered we had a shortage of bricks. This is something that the older orphaned children will be able to do that would give them some work as well as a sense of worth knowing that they are doing something meaningful. During the remainder of the noon break Elisha, Habakkuk and I discussed the future of the Bryce Homes Program in Myanmar. We are looking at the possibility of adding several more homes with parents who are graduates or teachers from the Discipleship School. With some additional support we can add these poor families, with their children, to the Bryce Homes Program and they will be able to add one or two orphaned children. All of the Homes, overseen by Elisha and Habakkuk, will continue to be built up in the faith with the gospel of Jesus Christ and His fellowship. They will continue to reach out to their surrounding communities which are mainly Buddhist . It gives me great joy to be able to share this information with you. Tomorrow I will report on my visit to Bryce Home Three which has been entirely sponsored by Sowing Circle Ministry since its inception five years ago. I finally arrived at the Yangon airport after 19 hours of actual flying with two layovers totaling about 7 more hours. With a few hours of sleep I was surprised how well I seemed to be feeling. Unlike last year when I arrived along with a flu bug from America, I was ready to go as soon as my feet hit the ground. My connection from Bangkok to Yangon was with Thai Air. The plane was full of tourists from Europe. This was my first indication of obvious changes that the country of Myanmar is undergoing. As soon as I got off the plane I headed down the escalator towards immigration. I could see Mang, Elisha and Habakkuk there to greet me. 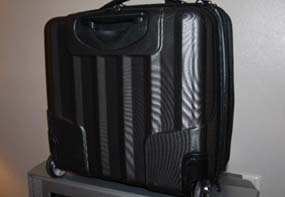 It did not take long to get through customs and pick up my suitcase. Unlike when I first traveled to Myanmar, eight years ago, there were no questions asked. The airport is now very modern and many different airlines are bringing passengers from all over the world. As soon as I made my way outdoors my friends were there to grab my suitcase and carry on bag. A car was waiting for us and we headed towards my hotel which is located downtown. In the past it took only 20 minutes or so to make the trip. Not today. There are so many cars on the streets that travel was nearly impossible. Many are new and imported from Japan and America. About one hour later we arrived at my hotel. The time in the car allowed us to discuss the itinerary while I am here and get an update on the Bryce Homes Program in Myanmar. My room was not ready, when we arrived, so we had more time to chat and pray about the schedule for the coming week. Suddenly jet lag caught up with me. While the conversation was going on I was lost in another world. It was time to go to bed. Tomorrow will be the first day of my busy schedule. In the morning I will be teaching and then later in the afternoon visiting Bryce Home Three and Bryce Home Six. I am writing this ministry update while I am flying somewhere between Los Angeles and Tokyo. I am on my way to visit the Bryce Homes in Myanmar. After we land I will have a few hours to stretch and walk around before connecting with another flight to Bangkok and then onwards tomorrow to Yangon. It is hard for me to believe that eight years have gone by since my first investigative trip to Myanmar. I am looking forward to meeting our leaders, Pastor Mang, Habakkuk and Elisha who give their time and dedicated leadership to the Bryce Homes Program. On my first trip to Myanmar in January 2006, I had no idea how God would direct our ministry over these past eight years. Immediately we saw a tremendous need in the country for Understand The Times to assist locals to care for poor and orphaned children. This would be a program we could operate in memory of our son Bryce who died in a car accident in August of 2001. Initially beginning with one Bryce Home and 20 children the program soon expanded to two Homes, then three, then four and now to a total of six. 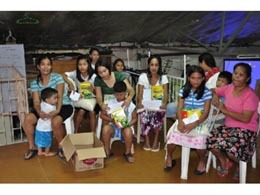 All in all, there are now about 80 children who are cared for by the program. Some of the first children are now graduating from school and have reached a point where they will either continue with secondary education or go back to their villages to be messengers of the gospel. The vision that God gave us continues to unfold. I am looking forward to see what the Lord has in mind for us this trip. I will be visiting five of the six homes while in the Yangon area and teaching on the topic of Biblical Creation at the Discipleship School that is under the leadership of Elisha and Habakkuk. The first day that I am in Yangon I will rest up before my busy schedule starts the following day. I will do my best to post daily reports so you can keep track of our progress. Our total budget to operate our Bryce Homes Program in Myanmar has been met each year for eight years through the generous support of individuals from around the world. While it is not possible for each one of our partners to experience the fruit of the ministry, that we experience on our annual visits to Myanmar, we hope that the reports we post on our web site will give you a glimpse of how your funds are being used to bless the lives of many hopeless children. Check out our Myanmar reports that we will post over the next several days. I write a letter in remembrance of you. I hope by the grace of God you, loving uncle, are getting well. I keep praying so that you may be able to visit us this year, too. I, your beloved son, La Mya Lay, live at Bryce Home 1, and am enjoying God’s grace. This year I enjoy three virtues: (1) joy, (2) peace, and (3) love by receiving God’s blessings. I am also becoming mature not only in physically and educationally but also in spiritual life. I am praying for you so that you may be able to support us in the future, too. I am also praying for you, your family and the sponsor so that God may pour His blessings upon all of you abundantly. Inexpressible thanks to those who are involved in sponsoring the Bryce Home One. May the Lord enable you to promote and develop the Bryce Home more and more in the future. I am writing this letter in remembrance of you. I, Linda Siang Hlawn Zing, am in Grade 11. I came from Kalay Township, Sagaing Region, North-Western part of Myanmar. I have joined the Bryce Home since Grade 4. I am so thankful to Grandpa (Mang) who arranged for me to join the Bryce Home 1 and to all the supporters you and your friends. Uncle Roger, I am so thankful to you for supporting Bryce Home 1. I am also so thankful to Daddy Siang and Mummy Par (BH 1 leaders) who look after me as my own daddy and mum. If I have been stayed at home I may not know God, and not go to the school. However, I am so thankful to you for permitting me to join BH 1. May the Lord abundantly bless you, Uncle Roger and all your co-workers. May the Lord grant all of you longevity and freedom from all kinds of diseases. I pray for all of you so that the Lord may continue to use you to supporting BH 1 in the future. I take this opportunity to express my gratitude to you for you have arranged for me to stay at BH 1. I also give thanks to God in my prayers for providing me food, drinks and clothes till today. Thanks to you and my sponsor for voluntarily supporting me since 2006. Thank you for taking care of my health. I would like to advise you to take care of your health. Thank you for you had visited us. I hope you are also praying for us every day. I also pray for you so that the Lord may give you His blessings continuously. I want to repeat again and again my heartfelt thanks to you for supporting us our every need. Thank you so much for supporting us [your sons and daughters] till today. Thank you so much for supporting us food, drinks and clothes till today. I am so thankful to you, Uncle Roger because you are supporting us till today. May God also bless you [Uncle Roger]. I am praying for your health and for your family. Above all, I keep praying for you that the Lord be with you and bless you in whatever you do. Uncle Roger, please come to our home every year. I welcome you any time. May the Lord guide you to be successful in your business and ministry. If you do not support us [your sons and daughters] we would not have opportunity to study in Yangon City. Without your support we will not gain education, general knowledge and good conscience. Now because of your support and because of God’s grace we can study in Yangon. Uncle Roger, thank you so much for upgrading our [sons and daughters’] lives. I always respect you and your attitude towards underprivileged children. I would like to inform you that I am so happy to be at the BH 1. Before mentioning other things I would like to give thanks to God for His grace. Secondly, I give thanks to you [Uncle Roger] for your kind support. If I [your daughter] stay at my own home, I would not be grown and increased in secular education and spiritual life. Because of your support I [your daughter] get opportunity to study in Yangon City. Thank you for supporting me [your daughter] attentively and without any wants. While many people are suffering from many problems and difficulties at their own home, we [your daughters] are able to study our lessons without any hindrances. Then at my own home I [your daughter] did not know anything. If I [your daughter] had stayed at my own home I would not know God. I [your daughter] would not receive salvation in Christ. Here at the BH 1 the leaders always teach us the word of God. I have come to know more about God. I also grow not only in physical but also in education and spiritual life. All these things have changed my [your daughter’s] life. I am so much thankful to you [uncle] and your family for your care and support. May God give you and your family many blessings. I [your daughter] so love you and your family. I write this letter lovingly and respectfully in remembrance of you. Roger, are you fine? I [your daughter] am fine. Uncle Roger, please take care of your health. Because of your support I [your daughter] have come to Yangon City. While I was at my own home I was not able to read well yet. I am able to read after arriving in Yangon. All these things are because of your support. I am so thankful to you for supporting us food, drinks, clothes and house to live in. At our village we cannot live like this social life. I always pray for you. When we have prayer meetings at BH 1, we always pray for you. I always pray for you so that you may be strong and healthy. Uncle Roger, I wish you to be healthy. Firstly I give thanks to God for permitting us [your sons and daughters] to live at the BH 1. I also give thanks to uncle [Roger] for supporting us [your sons]. I [your son] am so happier to be living at BH 1 than at my own home. I [your son] was very wicked at my own home. Before coming to Yangon I was smoking and chewing betel. If I was still at my own home it is obvious that my [your son’s] life would be very bad, and I would become a very wicked son. Countless thanks to God for He had brought me to Yangon using you [Uncle Roger]. I also give thanks to you [Uncle Roger] for your love and support. In Yangon I have many improvements. I have respect and honor to parents, teachers and persons who are older than I. I have no desire to do evil things. I [your son] have improvement also in spiritual life. I also regularly do scripture reading and prayers. God is so precious in my [your son’s] life. He is so good to me. I always give thanks to God. I also always commit Uncle Roger’s [your] life to God so that you may be able to support us [your sons] constantly. I always pray for you so that you may be able to support not only BH 1 but also other Bryce homes. We [your sons and daughters] will not forget your grace. I [your son] especially commit my life to God so that in the future I would become like you. I love you as my own daddy and mummy. I always pray that the Lord may bless you so that you may be able to support all the Bryce homes that you love them so much. Thank you so much, Uncle. Because of the grace of God, who so loves us, I arrived here at the BH 1. I give thanks to God for this regard. I am so happy to be at BH 1. Thank you so much for supporting us. I get so many improvements living at BH 1. I am very happy to live in Yangon. Last year I was so sorry to hear that Uncle Roger [you] were seriously sick. But now I give thanks to God for He has granted you a good health. Please take care of yourself. I am so thankful to God and to uncle [Roger] for the support and help providing us food, drinks and residence till today. First of all I pray that God may bless you abundantly. I am so thankful to you and other individual sponsors for their support. 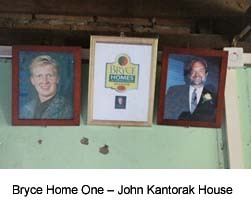 Thank you [uncle] for your sufficient support right from the beginning of Bryce home project to this time. We [your daughters] are praying so that God may bless you. We [your daughters] are very grateful for giving us first priority to support and showing steadfast love toward us. I also give thanks and praises to God for preparing for me this BH 1. I am so thankful to God for His grace and mercy. I give thanks to God even in the times of sickness and feeling sorry. Living at BH 1 is not only just comfortable but also pleasant and joyful. When we hear of uncle’s [your] poor health your daughters [we] keep praying for uncle [you]. May God grant you strength and good health. Your daughter [I] invite uncle [you] to kindly visit your daughters [us] again. Firstly I give thanks to God for His grace. This is the grace of God that brought your daughter [me] to BH 1. To be staying at BH 1 has many benefits. There are many changes as well as improvements. Everything is because of God’s grace. I am so thankful to the foreigners who are sponsoring your daughter [me] till today. I always pray for them all. I am also thankful to the leaders who attentively looking after us. If uncle [you] and all the leaders do not support your daughters [us] we would not have sufficient materials to learn education. I regard Joining BH 1 as the will of God. Once again I give thanks to all the sponsors and supporters. May God bless all those who are involved in supporting us. First of all, I give thanks to God for His grace. I also give thanks to uncle [you] for supporting us financially. Living at Bryce Home, your daughter [I] have many changes and improvements in education, character and spiritual life. If I live at my own village I may not get wisdom and knowledge. God has sent [me] your daughter to the right place. If I live at my own village I may do evil things. I may not know how to honor my parents. After joining BH 1, I came to know how God is good, how a good character is important and how the gratitude of parents is great. I also give my heartfelt thanks to grandpa [Mang], grandma [Kip, Mang’s wife], daddy [Siang] and mummy [Parte, Siang’s wife] who are closely supervising us every day. Thank you very much for visiting your daughters [us] once a year. As you are praying for your daughters [us] your daughters [we] keep praying for uncle [you]. I would like to express my heartfelt thanks to all the supporters and sponsors for their financial assistance. First of all, I would like to give thanks to God for His guidance and leading us till this day. I also give thanks to uncle [you] for your financial support till today. I am also very much indebted to those who are involved in supervising the Bryce home from the time of my entry into BH 1 up to this day. There are many advantages for me to be living at BH 1. I come to know God whom I never knew before, and I come to know God’s goodness that I never consider. I also have many good experiences here at BH 1. My life is changed, and I have many changes in terms of education, behavior and spiritual life. If I stayed at my own home I might not know anything. I might not have good experiences. I might abuse drug and became a wicked boy. But God loves me so He does not allow me to do evil things and become a wicked boy. I am so thankful to God for using uncle [you] bringing me to Yangon, and supporting me to study in Yangon. We, the children of BH 1, love uncle [you] because you love us first. When we have prayer meetings we pray for uncle’s [your] health, your ministry and your family without forgetting. Thank you for your constant support and concern for me. I also thank all the leaders and all the sponsors for their supervision and financial support. First of all I give thanks to God for His grace. My arrival at BH 1 is only because of God’s guidance. I came to realize that there are many advantages in staying at BH 1. Above all, if I lived at my own village my life would be like a boat that cannot reach the beach. Even though I might go to the school at my own village I could not reach my goal. I am so thankful to uncle [you] for your financial support. I am also thankful to the sponsor and the leaders at the BH 1. I always pray for uncle [you]. May the Lord bless the supporters, sponsors and supervisors of the BH 1. God bless you so that you may be able to bless others. This is by the grace of God your sons and daughters [we] get opportunity to stay at the BH 1. I am so thankful to uncle [you] for supporting your sons and daughters [us]. I am so happy to be living at BH 1 because I gradually come to know God. It is my constant prayer that the Lord may guide you to be successful in your ministry. If uncle [you] do not support me I could not come to Yangon. Because of this I am so thankful to uncle [you]. When I was at my village I could not go to the school. But here in Yangon I can regularly and smoothly go to the school. I am so thankful to uncle [you] for providing us food, drinks, clothes and a shelter to live in. At BH 1 we meet with many friends. Thank you for supporting us till 2013. Thank you [Roger] so much for supporting us. While I was at my village I was not able to read yet. When I arrived in Yangon I have many friends. I am also able to read. I ever heard about God, but I did not know Him. In Yangon I attend Sunday School every Sunday. I also go to the church. For that reasons I come to know more about God than before. All these things are because of your gratitude. If I did not come to Yangon I could not go to school at my home village. I do not have even enough food, drinks and clothes. I am so thankful to you for sufficiently supporting us food, drinks, clothes and any other needful things. I pray that the Lord may bless you to bless us. Uncle Roger, please take care of your health. I am at the BH 2. I would like to express my word of thanks to you and your team members. Thank you, Roger. I am so very much thankful to you for giving me enlightenment, preparing me to know God, helping me to have knowledge, skill, and education. Because of your benevolence I am able to go to the school in Yangon. I have opportunity to know about Jesus Christ who saved me. I also have wisdom and knowledge here in Yangon. If I was at my home village I would not know Jesus Christ. Not only that I would be working at the paddy field, and I use up my times without knowing about the world. Now I come to know the mystery of creation and how adventurers take risk in discovering God’s wonderful creation. Now I am in Grade 11 (University Entrance Class), the highest and final grade of Myanmar High School. Your support is fulfilling my ambition. If you and your team do not support me I may be in thick darkness, no light, and I would be living with the lost souls. Thank you, Roger. I believe God is with you and your friends. I give thanks to the supporters and the sponsors. I also give thanks to Grandpa [Mang] and Grandma [Kip, Mang’s wife who closely look after us, and buy the needful things for us. I also give thanks to Daddy [Van], Mummy [Mawi, Van’s wife] for their love and concern about our daily life. They all are very good to us. They have understanding upon us, and we live warmly as a big family. All these things are because of God’s grace and the support of you and your friends. We all are very happy to be living at BH 2. We have opportunity to enjoying God’s grace. May God bless you and your friends who sufficiently and comfortably support for our school materials and fees, clothes, food and drinks every year. May the Lord pour out His blessings upon you and your friends. May the Lord enable all of you to be successful more and more in your business and ministry. First of all I want to give thanks and praises to God because even though I have many sins He still loves me with great love. I also give thanks to you and your friends for sufficiently supporting us. May God bless you all so that you and your friends may be able to sponsor more children than these ones. Your daughter’s [my] health was very poor in my childhood. When I was sick my parents could not buy medicines for me. Since my parents could not send me to clinics, I went to the school four years later than other children due to my poor health. If I was at my own village I could not go to the school, and I could not able to learn education. I would not be able to study up to Grade 11 (University Entrance Class). I might be helpless and hopeless. I give thanks and praises to God for He talked to your heart to support the children in Myanmar. I can regularly go to school here in Yangon. Every day I can go and come back home joyfully. This is because of God’s grace and you and your organization’s benevolence. Whenever I pray I always pray for the smooth running of your organization. If you and your organization do not support us we would be hopeless and helpless. When you visit us once a year we are so joyful and delighted. We are also so thankful to you. I keep praying for you, your organization and all your families so that all your business and work may be smoothly running without any difficulties. Only after arriving Yangon I come to know of the goodness of God, and Jesus Christ as the only Savoir. Grandpa [Mang] and Grandma [Kip, Mang’s wife] patiently watch us, and provide our needful things in details under your plan. The leaders and helper also regard and admonish us as their own sons and daughters. All these things are because of God’s grace. When I become an adult I would like to be involved in God’s ministry to extend His kingdom in Myanmar. Here at Bryce homes the students of Grade 10 and Grade 11 are sent to outside tuitions. At my own home I may not be able to go to outside tuition. I am looking forward to having fellowship with you next year. In fact your gratitude and benevolence are of unspeakable. I will be keeping praying for the convenience and smooth running of your ministry and organization. Roger, are you fine? Your daughters [we] are all fine. I hope you and your friends are also fine. I would like to share with you my testimony. May the name of God be greatly glorified who allowed me to live in good health every day. I have lived in Yangon for 8 years. I give thanks to God for providing us food, drinks, clothes and house to live in. At my own village I did not live in a good shade house. We do not have our own house. We lived at a rented house, and almost every year we moved to another house. Above all we did not have enough money to go to the school. To buy book, pencil and ball pen we hardly sought for money. Even one exercise book we bought it on credit. And we wrote all subjects in one exercise book. We had no good clothes so we bought used clothes for schooling. Since my parents divorced each other only my mother looked after three daughters and one son. We had no good clothes so we go to the church with the clothes given by other people. We lived in a difficult situation. When we went out in the hot sun and in the rain we had no umbrella to put up, and we had no slipper to put on. In that critical situation I arrived under Bryce project so I am very thankful to you and the sponsors for providing not only school fees but also school materials such as school bag, books, ballpoint pen, pencil, umbrella, etc. In Yangon when we go to the school we can study our lessons without any difficulties. And we are provided school materials more than enough. I did not know God, but at Bryce Home 2 the leaders teach us the Bible, and I come to know God. Above all, I come to know the goodness of God, and I come to know that Jesus died for all people. If I lived at my own home I would be like the children those who could not go to the school. I would not know God and my life would be meaningless and without happiness. I am so thankful to you for enabling me to study in Yangon. Your daughters [we] are so thankful to you for calling us as Bryce Home 2, and supporting us financially. Your daughters [we] always pray in our evening devotions that the Lord may enable you to support the Bryce Home 2 for many years in the future. Above all, it is our constant prayer that the Lord may provide us our own residence even if it is a small house. Kindly pray with your friends for this regard. I would like to share with you and your friends my testimony briefly. First of all I give thanks to you for supporting BH 2 right from the foundation of Bryce home till today. I am so thankful to you for supporting us without any wants. I also give thanks to God for allowing me to be living at BH 2. We always pray at our evening devotions to get our own shelter. I also give thanks to God for granting me good health. Thank you so much for giving me opportunity to study in Yangon City. I am very happy to have new clothes in Christmas season. Thank you for taking care of us till today. While I was at my village I gave priority to my younger brother and younger sister. I did not get any good clothes. I only got used clothes from my elder sister. Actually my parents wanted to buy new clothes for me, but due to financial difficulties they could not do so. Though my parents could not buy new clothes for me, I am so thankful to you and your friends for supporting us and providing the needful things. Thank you for buying new clothes for me. Since you are supporting us we do not have to worry about food, drinks, clothes and shelter. Many people earn money for one meal after working very hard. But we do not need to work hard, but we have opportunity to go to the school without worrying for food. Thanks to you and your friends for supporting us constantly. Are you fine? By the grace of God your daughters [we] the family of BH 2 are all fine. Your daughter [I] hope you and your friends are all fine, too. Your daughter [I] have lived in Yangon for 5 years. Your daughter [I] would like to share with you about my testimony that how much you and your friends love and concern for us. My family is very poor. While I was at my village I could not go to the school properly. I could not have enough books, ballpoint, pencil, ruler, etc. I could not wear good clothes. I could not eat good food. But God uses you and your friends to provide your daughters [us] food, drinks and clothes sufficiently. Now your daughter [I am] in Grade 7. If I live at my village I would not study up to Grade 7. I am really happy to be in Yangon. I always pray before I go to bed that the Lord may bless you and your organization. Your daughters [we] always pray that your ministry may be successful, and your daily work be smoothly running without any difficulties. Above all, we always pray also for getting our own shelter for BH 2. Your daughter [I] believe that God will provide us using you and your friends what we ask for at the right time. If I compare my village and Yangon it is very different to each other. At my village I did not know God. In Yangon I come to know God in the proper way. Your daughter [I] really give thanks to you and your friends. Your daughters [we] always pray that you and your friends may be able to support the Bryce homes more sufficient than now. Are you and your fellow workers fine? Your daughters [we] are all fine. Thank you so much for supporting us for our school fees, school materials, food and other needful things sufficiently. If I live at my village I would not eat this kind of food, have clothes and house. I am so thankful to you and your friends for helping us with genuine love and gratitude. If I be at my village I would not go to the school. I could not be able to buy school materials such as books, pencil, etc. Thanks to you and your friends for providing us our needs. At my village I could not buy books due to lack of money. We borrowed money from others. So we wrote all the subjects in one exercise book. Now there are still many children at my village who cannot go to the school. I am so pleased to study in Yangon City. I am so thankful to God for His kind guidance and bringing me to Yangon. I am so happy and thankful to you for your kind and constant support. If I live at my village I will do hard work, and may not be able to go to the school. Living in Yangon I do not have to do hard work. I do not work under the hot sun and rain to earn money for schooling. But because of the support of you and your friends I am able to study my lessons in the classroom. Thank you so much for your kind support. Your daughters [we] keep praying for the smooth running of your ministry. I wish you to celebrate Christmas joyfully and healthily. May the Lord bless you and your friends. My name is Naing Tam. I joined the BH 2 in 2006 while I was in Grade 3. This year, 2013 I am in Grade 9. I am so thankful to God as well as to you and your organization for supporting me till today. I am especially thankful to my sponsor for financial support. My parents have 8 children, and altogether our family is ten members. I am the youngest boy among my brothers. In my family members no one passed Grade 11 [University Entrance Examination]. Some of my family members never go to the school. My parents could not send all their children to the school. As a result one of my sisters is also sent to a children home in Taik Gyi Town, Yangon Region. I am the only one hopefully expected by my parents. I give thanks to God for His guidance. I am so thankful to my sponsors for supporting me till today. Because of my sponsor’s support I am able to go to the school without any interruptions. We always pray for you and your co-workers. I would like to request you to kindly support us constantly. If you and the sponsors abandon us we all will lose our dreams. In order to fulfill our goals we are extremely in need of your support. In my native place many people have no clothes to wear and no food to eat. In the midst of these difficulties God blesses us through you, and we are provided food and clothes sufficiently. Because of your love and concern we are able to go to the school in Yangon. In my native place there are very few lands to be cultivated. The production of the crops is also going down, and livelihood is very difficult. My parents are expecting me to be an educated one. If I go home it is sure that I will do cultivation, and my parents will be very much discouraged. I am so thankful to you and your organization for the financial support. I am so sorry for I cannot do anything for you and my sponsor. The only thing we can do is just to pray for you and your friends. May the Lord bless you and the sponsors constantly. Firstly I would like to share my testimony. I give thanks to God for providing me food, drinks, etc and a shelter. I give thanks to you and your organization for supporting me right from food and drinks. We pray for you and your friends so that all of you may celebrate Christmas joyfully. I missed you so long. I pray for all of you before I go to bed. If I stay at my village I would not go to the school. I might not be able to read. I might not know about God. But now I come to know that God knows His sons [children], and wants them to believe Him. God has talked to your heart. I came to Yangon smoothly and safely. Because of your gratitude I can go to school smoothly. Now I can read what I could not read before. I come to know about God, and how much He loves the world. If I stay at my home I might not know the greatness of God’s love. I am very happy to be living at BH 2 because I read books, and I come to know God. So I am very happy. Every day we pray for getting a shelter for the BH 2. Now I am in Grade 8. I am so happy that when I go to the school God guides and protects me. I also give thanks to Grandpa [Mang] and Grandma [Mang’s wife] for always buying our needful things. Finally what I want to mention is that I wish you and your friends to celebrate Christmas happily. May you be able to celebrate Christmas healthily. I always pray for you. Your daughters [we] are very happy to live in Yangon. I have lived in Yangon for 7 years. Because of you and your friends’ support I can live healthily and without any difficulties. Because God uses you, you send money for your daughters [us] to buy food and drinks. You and your friends also rent a good house for us. When our slippers are broken you buy new ones for us. You also buy for us school materials completely. Thank you so much for sending money to buy school uniforms. In Yangon we go to the church every week so we are closer to God than before. Every Sunday we go to Sunday School. At Sunday School we are taught about God and Bible stories so we are happy, and grow in spiritual life. At my village I lived as I like without devoting to God. Since I did not know God, I did not think about Him in my heart. I did not obey my parents. As now I live in Yangon I come to know the advantages of obeying the leaders of Bryce home who represent my parents. I want to become a wise and honest daughter. I come to know the love of my parents through the teachings of Bryce home. I come to have the honor and respect to my parents and teachers. As I live in Yangon I have a broad view. I have gained different knowledge. I have opportunity to know the things that I did not know at my village. Your daughters [we] are very fortunate to live in Yangon. I can study my lessons well because you grant us money to buy school materials. When I consider your love and gratitude I have determined myself to study my lessons hard. If I were a rich person I would not want to work hard. Your daughters [we] receive full support, but there are many children in my place who need help. I am very much indebted to you for raising funds hardly and toiling for us. May the Lord make you successful in your ministry. Firstly I want to give thanks to God for granting me good health. God is so good to us. Are you and your friends fine? By the grace of God we, the whole family of BH 2, are fine. I hope you and your friends are all fine. Just before going to bed we pray for you and your friends so that God may grant all of you good health. Thank you so much for supporting us our needful things. At my village I could not go to the school. My parents could not send me to the school. They could not buy for me beautiful shirts and pants. So I did not have such kind of clothes. But by the grace of God I came to Yangon. Thank you for sending me to the school. I am very happy to be at school. Thank you for your support. Here at BH 2 Daddy [Van] and Mummy [Mawi, Van’s wife] teach us gospel songs. Daddy Van teaches us how to play the guitar and keyboard. Mummy Mawi teaches us the Bible and about God. Now I can play the guitar and sing a song. All these things are because of God’s grace together with your love and concern. We keep praying that you may be able to support not only the existing children but also the new comers in the future better than now. I also pray that you may celebrate Christmas with great joy, and step into the New Year. Firstly I want give thanks to God giving us food, drinks, clothes and a house. I have stayed at BH 2 for 7 years. I give thanks to God again for granting me good health till today. While I was at my village I could not buy writing materials such as pencil, eraser, ruler, etc. I give thanks to you for supporting me wholeheartedly and sending me to the school. If I lived at my village I would become an illiterate boy and know nothing. There are many children in my native place who cannot go to the school. Thank you, Roger for choosing me and bringing me to BH 2. I pray for you and your friends. Above all, I also pray for you and your organization for the smooth running and success in the work. Here in Yangon we go to the church. At my village I did not want to go to the church. In Yangon I have to know about God. At my village I was always at home, and always playing. For me to live in Yangon has many advantages. I am very happy at BH 2. I get different educational knowledge from the school. I also give thanks to Grandpa [Mang] and Grandma [Mang’s wife] for buying the needful things for us. I am so thankful to them for buying food. I also give thanks to our leaders Daddy Van and Mummy Mawi [Van’s wife]. We have many wrong doings. I give thanks to them for forgiving us. When we do mistakes they admonish us not to do them again in the future. Thank you Dad and Mum for looking after us understandingly. I pray that you and your friends may happily and healthily celebrate Christmas. First of all I give thanks to God for allowing me to study in Yangon. I also give thanks to you for your love. I have been studying in Yangon for 6 and half years. I am so thankful to you for supporting us within these years. I request you to kindly support me up to Grade 11. I am very happy to be in Yangon. Here at BH 2 we live in a good house. We also enjoy tasty and good food. All these things are because of you. If I live at home I will not live in such a good house. I will not eat such good food. But I will be keeping oxen/cows. I give thanks to God for setting me free from cow keeping, and giving me opportunity to meet with you. Thank you for supporting us financially. Kindly continue supporting us in the future too. I also give thanks to Daddy Van and Mummy Mawi [Van’s wife] for their daily supervising. I also give thanks to Grandpa [Mang] and Grandma [Mang’s wife] for buying our needful things. I always pray for you. I pray that you may be healthy, happy, successful and able to support us without ceasing. I will never forget you even when I leave the BH 2 after passing Grade 11. I will not forget our family, BH2. Big thanks to you and your organization. Firstly I give thanks to God who provides us food, drinks and clothes. Secondly I give thanks to you and your organization for supporting us our needs. At my village we could not eat this kind of good food. We could not wear beautiful clothes. God loves your daughter [me] so He brought me to Yangon. Because of God’s grace I could reach Yangon safely. Because of your support I can go to the school, and eat good and delicious food. At my village there are many children who cannot go to the school. Because of God’s grace I can go to the school here at BH 2. I can wear beautiful clothes. I did not know God at my village. I did not want to go to Sunday School. In Yangon I come to know God. On Sunday we always go to the church to worship and praise God. Thank you, Roger for providing us writing materials such as pencil, books, ballpoint, eraser, ruler, etc. Thank you for providing our needs spending a lot of money. Thank you for buying food and other things spending big amount of money. I also give my heartfelt thanks to you and your organization members for their constant support. I wish all of you to celebrate Christmas happily. I pray that you may be healthy, have peaceful life, and live over a 100 years. I hope you are fine. Your daughters [we], the BH 2 family members, are all fine. Because of the love of God we can live in harmony. The love of you and your organization members is very great for us. I pray for you and your friends before I go to bed. In our devotions we also pray for all of you. Because of your love I can study in Yangon. We are studying at a very big school, we are very happy at the school with many friends. Whenever I consider how we study here in Yangon I do realize your love and concern for us. All this things are the outcome of your love, and the grace of God. I want to express my thanks to Grandpa [Mang] and Grandma [Mang’s wife] for buying clothes, slipper, umbrella, ballpoint, furniture, school materials, food and drinks. May the Lord grant them long life, and freedom from dangers. I also give thanks to Daddy Van and Mummy Mawi [Van’s wife] for regarding us as their own children. I give thanks to them for their love and instructing us good moral. I will never forget their love. God is so good to me. I was born in a poor family. However, because of God’s grace I could join BH 2 in Yangon. I never dreamed to enjoy this kind of social life. I am exceedingly thankful to God as well as to you for supporting in every corner. I promise you that I will try my best and work hard. I believe God will give me good status. I wish you to be happy and peaceful in this cold December. I also wish you to enjoy the essence of 2013 Christmas, and be happy throughout your life by reading this my testimony. First of all I want to thank God for giving me good health. I also give thanks to God for enabling me to go to the school regularly this 2013. Thank you, Roger for supporting us constantly. I always pray before going to bed for you and your organization members. Because of you and your friends I can go to the school. Inexpressible thanks to you and your members for providing us food, drinks and house. I give thanks to God for protecting me my goings and comings without any dangers. I also give thanks to God for providing us food, clothes and other needful things. If I live at my village I would not go to the school. I give thanks again to God for leading me to study in Yangon. Because of your love and support we can live comfortably. This year I am in Grade 7. God is so good to me. Because of you and your friends’ support I can study without difficulties. Though my parents could not send me to the school God has sent me at BH 2 to study in Yangon. I am very happy to live at BH 2. Our Grandpa [Mang] and Grandma [Mang’s wife] provide us our needful things through your support. Great is the privilege of serving our Great King. I write you this email with thanks giving for all that He has done throughout the years. It’s clear enough from us how God has been leading us and using you. It is not by chance but by plan and purpose. I believe He who speaks to the hearts of the donors and causes us to have strong commitment to share and defend the Gospel of Christ among Buddhist community and spiritual deceptions in this last day will continue to accomplish His Mission in His perfect Way. We must work at Making Disciples simply because God demands it. It is a matter of obedience to our Lord. 1. Please pray for the 5 students of Making Disciples Ministry School, classes, ministry activities in Yangon and outside of Yangon. are a round 400 children there in Children criminal prison in Yangon. 3. Please pray for the Gospel team and December 2013 activities, Personal evangelism, distributing tracts, singing Gospel songs and sharing the Gospel of Christ house to house, local to local, and village to village. Paul said, “pray also for us that God would opens un to us door for utterance, to speak the mystery of Christ, for which I am also in bonds: that I may make it manifest, as I ought to speak” (Colossians 4:3-4). 4. Please pray for projector and good video camera which is very needed for the ministry activities. 5. Please pray for the missionaries and MDM teachers. (1) Salaphan is serving the Lord at Shwelinpan. (2) Khuasik is at Yu Yu Lay. (3) Thar New is at Aungchianta nearby West University of Yangon. (4) U Hla Thun is at Chaung Suh village Delta area. (5) Andrew is at Mindat (6) Adrew’s brother Lingkhawkhe is at Lukpe village of Mindat. (7) Kawma is at Sami, Paletwa, (8) Pawng Than Senthang village (9) Habakkuk at Insien, Yangon and (10) Elisha at Nawaday, Hlaitharyar, Yangon. Please pray that God continue to stand strong for the Gospel of Christ and to provide daily bread. their family and Neighborhood school because she is the main person. We see that Satan is active when the Holy Spirit is at work. But God is greater than all. So, pray that God will strengthen her to overcome all kinds of temptation. Thank you once again for standing with us for the Gospel of Christ which is the greatest need of every one. On the first week of October, we began class with spiritual conference. We have 5 committed students at present. They all are under 20 years old. Pastor Ringa who supposed to come there to be a pastor could not yet received his calling later. So, he is a voluntary warden at present and Donga is a student leader. Monday to Friday, we have regular classes. Wednesday night and on Saturday we have Ministry activities all together with the teachers. And Friday night is fixed for fasting and prayer. Sunday, we have Sunday school for children at morning and noon time we have church service at Shwelinpan afternoon youth fellowship and learning songs and Sunday evening at Neighborhood school. Not to be famous but to be great in His sight. Not just to be used by God but to be men of God. Not just success men but to be men of value. Not to be success in ministry but to be success in life. Thank you for standing with us faithfully for the Gospel of Christ. I feel in need to share with you the wonderful works of God in October 2013. At the time when there is natural new born baby of Shwe Shwe Oo’s mother, there are 7 new born babies spiritually and one of our members died and we have funeral service at the same time. I thank the Lord for giving us privileges to share the Gospel of Christ to several people at the funeral service. The dead one was 42 year old. Please pray for the remaining family (his wife and 3 children). We baptized the 7 new born believers based on their confession of faith in Christ last Sunday. Please also thank the Lord and pray with us for Shwe Shwe Oo new brother and 7 new born babies spiritually that they might grow in grace and in the knowledge of Christ. In this quarter, we have ministry activities as follow:-Salaphan and Hnemte have ministry activities in top 5 area and Shwelinpan Church’s local area. 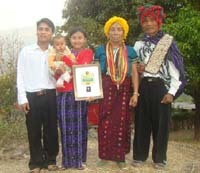 Thar New’s family move forward to a new local called ‘Aung Chian Ta’ nearby Yangon West University. Khuasik could continue to serve the Lord there at Yu Yu Lay. U Hla Tun who joined with us actively in house to house visitation in Delta area could continue serving the Lord at Chaung Suh village. 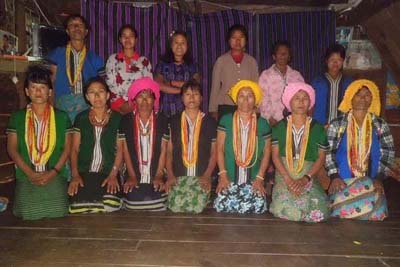 Kawma could begin serving the Lord there at Sami in caring 9 students. Ling khaw Khe is a missionary pastor at Lukpe village where there are many animists. Andrew is a director of Bryce Home 4 at Mindat. He could organize Bryce Home 4 as Mindat Home church. Habakkuk, director of Bryce Home 5 could continue daily devotion with the children and teaching the Word of God at outside as well. Elisha, Bryce Home 3 director is pasturing at Shwelinpan at the same time leading the children at home as well. 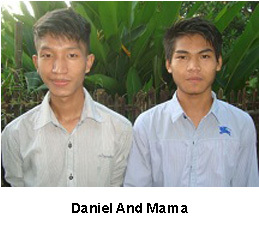 Donga, Win Tun Win and Daniel, Discipleship students are now actively involved in ministries activities and will continue to study from the new month at Discipleship school. In July, Kawma from Paletwah, Andrew and his brother from Mindat, U Hla Tun from Delta area came to Yangon to get together with the 7 Yangon team members and discussed (have a retreat) on the needs to be faithful followers of Christ and we all are encouraged to continue in following the simple methods of Jesus as the early church did. As a result, we have dedication prayer for Kawma and U Hla Tun according to their personal commitment to be full time missionary. Thar New and Daniel followed Kawma to Paletwa to help to begin his mission work and Habakkuk, Salaphan, Donga and Elisha had a trip to Delta area to help the mission work of U Hla Tun and come back with joy for seeing what the Lord has done in the village. From the new month, we are going to have Discipleship school classes and we will have practical activities among the Buddhist community. Please pray with us that the way of our living might preach that the Word of God that come out from our mouth might bring glory and honor to Him. Greetings in His name. I hope you are doing well as it is our constant prayer. 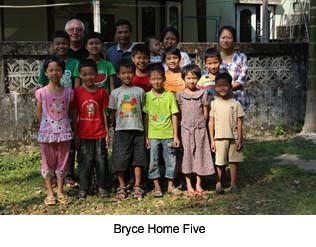 I would like to give an update of Bryce Home Five in Myanmar in short. We praise God for His never failing love and care in every situation thus far and His blessings through you all who take part in the ministry of Understand The Times all over the world. Bryce Home Five family is so blessed in the years of the Lord 2012-13, the fruit of the womb a female child by name Grace Lal Thuam Mawi (now 10 months old) and also a new keyboard that will be useful for praising God, daily livings and all other blessings that we could enjoy as a family of God. residence next year as we need to move again by the end of March 2014. God is so good to us that He has been preparing this family by using His faithful servants in the ministry. And I hope He will accomplish His purpose in our life for His kingdom sake. The children are so happy and improving their living standard compared to their situations before educationally and spiritually as they have been fervently taught. May all those blessings and works bring glory and honor to His name. Greetings in the most precious name of our Lord Jesus Christ. 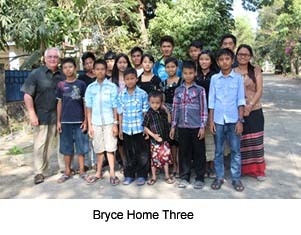 I praise God for His loving care for the Bryce home five family in Myanmar thus far. By His grace we have 10 orphans and 2 of our biological children (12 children) this year 2013. I have been so busy for the school admission as we have moved to the new place, taking TC for all and buying their school uniforms for each of them. God is so good to us that He meets all of our desperately needs through His people in the ministry of Understand The Times. All our kids could now pronounce the names like Roger, Tom, Grant's family, Larry and Debbie etc., in the the prayer meetings. I personally would like to express my heartfelt thanks to God for His love that changes of the children's lives, makes them developed in the Christian character. And I hope God will accomplish His special purpose in me some day. I herewith attached pictures that will remind you all to keep them in prayers. Please continue to uphold us in your prayers that we can live for Him alone in all kinds of circumstances as we live in the world where the Devil tries very hard in his business. Hope that all is well with you. Now is the time for reopening the school in Myanmar. So, each of Bryce Home is busy with the children admission, to buy school uniform, school bags, umbrella and stationary. Here I send you Bryce Home 3 children photos with their school uniform. And let me also give you the update about our co-workers in Making Disciples Ministry. 1. 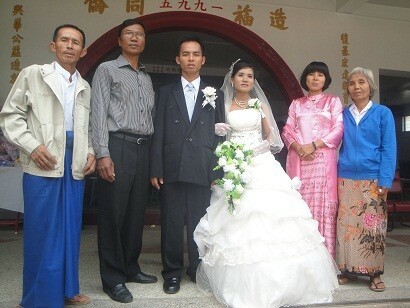 Salaphan, a Discipleship student is newly married with Hnemte our helper 3 in childcare ministry. They are committed to serve the Lord as missionary. Presently, they stay at Shwelinpan church. They pray God to give Motor bike for it is really in need for the ministry activities. 2. Thar New, a Discipleship teacher and family move forward to a new mission field. It is near by West Yangon University. Outreach focus is through the children because this is a good way to approach their parents. 3. Khuasik, a Discipleship teacher is a missionary at Yu Yu Lay. He has a good relationship with the adults and feed them God’s Word regularly. A good way was opened through Children school ministry. 5. Khawma, a Discipleship student is committed one to be a missionary but he does not yet determine for the place where he will serve. Their house and the rest 5 houses at their village were burned by fire in March 13, 2013. 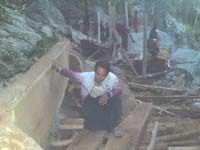 They need help because non government organization arrive there in their village for they are in the undeveloped area of southern Chin State. 6. Ling khaw Khe is a missionary pastor at Lukpe village where there are many animists. He needs monthly support for the mission work. He is working very hard in teaching the children. Sad to say about the movement of Buddhist in this area. As we care the children to be strong Christian, Buddhist monk is sent to settle near by Lukpe village. He persaute the Animist parents and bring their children to Yangon to train to be strong Buddhist monk. 7. Andrew is a director of Bryce Home 4 at Mindat. The purpose of God through his children ministry is clear enough to us. Future of their area is there in the hands of Bryce Home 4 children.8. Sumpi is just a part time teacher at Discipleship school but very active with us in the ministry.9-10. Donga and Win Tun Win, Discipleship students are now actively involved in ministries activities and will continue to study one more year at Discipleship school. 11. Za Thio also plan to go forward in a new field.12-13. Habakkuk and Elisha are coordinators at Discipleship school at the same time they have children ministry at Bryce Home 3 nd 5. We also pray for the need projector and good camera for the ministry. This week, I personally teach Bible lessons from the life of Abraham. Word can not express how much we are thankful to God for this precious privilege though your prayer. Through this trip, we come to realize more about the purpose of God through our co-worker Andrew and his brother's children ministry. 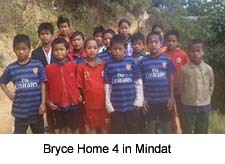 In May 24, we arrived Mindat village where Bryce Home 4 is located. there we sleep the night and have prayer meeting with the children. Habakkuk led us and shared the Love of Christ that has seen to them through His people. In May 25-28, we have worship service for five times and house to house visitation. God really bless His Word there. Many of them rise up their hands when we invite them to surrender to Christ. God knows the real ones. 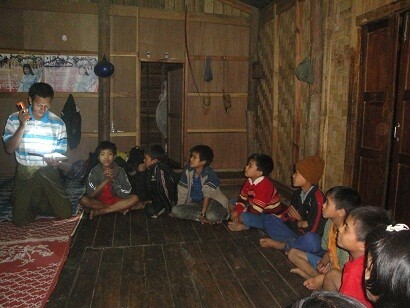 Even Animist family come to listen and Pastor Ling Khaw Khe is working very hard to train their children with Christian education. Our trip means alot to encourage his works. In May 28 night, we come back to Mindat and take time again with Bryce Home 4 children.Sad to say, Satan is working very hard there. As we care the children for the purpose of training them to be strong Christians, Buddhist also send a Buddhist monk to settle near by Lukpe village and working very hard to persuade Animist parents in surrounding villages. When we were in Mindat, he brought several children to send to Yangon and train to be strong Buddhist monk.It tells how much more we need to commit to pray. In May 29, we leave for Mokuk where our co-workers Salaphan and Hnemte have wedding ceremony. There God is in glory for they both set a good example for other believers through their holy matrimony. We also have privilege to share Marriage and family according to the Bible. In May 3, we arrived back to Yangon safely with His protection and guidance. These are all because of your prayer and financial support. How are you? Hope that everything is well with you as you work hard for Him in the ministry. We always remember you in our prayer. Thank you also for your prayer for our mission trip to Paletwa. 6 houses were burnt by fire at Senthang village including the house of Kawma Discipleship student two days before we got there. Everything that they have was burn away. In this village, we spent 3 days and four nights. On the first day we helped rebuilding a relief bamboo houses with the people of the neighboring villages. Every night we have a good time to share the Word. And Saturday and on Sunday, we spent times in teaching and encouraging them with the Word of God. As we seek His guidance first by prayer, we felt that the Lord brought us there to the real needy people in time of needs. On the way to get there, we have privileges of sharing the Word at two villages. And on the way back from there we have two places again of gathering the people to have open air preaching. Many people got spiritual blessings through this trip. We praise God for His leading hands and for the privilege. They are desperately in need to help them with the relief work because they have lost the entire paddy that they keep for one year, their houses and all they have. They are neglected people because no fine transportation and no education for there is no government school in the villages. Future of Senthang village is there in the children. We have learnt one teacher can run a school with $50 per month. This is in need to raise real Disciples of Christ. We acknowledge that we have this precious privilege of serving the Lord through your financial support and prayer. May God give you more Grace. I am pleased to inform you that I send the Annual Report for Bryce Homes One and Two as follows. I also send some pictures of the two Homes as attachment. Firstly, I greet you from Myanmar in the precious name of Jesus Immanuel who was born in a manger. It is my great pleasure to write this Annual Report of Bryce Homes One and Two. 1. Resident Children: There are 18 children at Bryce Home One, and 18 at Bryce Home Two, altogether 36. There are three teachers in each home. 2. Their Schooling: The grades and the number of children are as follows. 3. Christian Education: Every Sunday, Wednesday and Friday the two homes organize evening devotions. The teachers lead the devotions in turn, and the leader gives encouragement from the word of God. After hearing the message, they offer intercessory prayers. The children then give their testimonies. The teachers and the children are very much encouraged through the testimonies and reflections given by the children. This inspires and promotes the social and spiritual lives of the children. They organize Sunday School at 7:00 am in their respective homes. The students of Grace Theological College are very helpful in teaching Sunday School. The children are actively involved in the Sunday Church worship service by means of presentations of solo, group song, action song, recitation of the Bible passages singly or as a group. The congregation is very encouraged to see and hear the presentations of the children and their testimonies. 4. Music: It is very encouraging to know that some older boys can play the guitar and keyboard at their home devotions, Sunday school classes and presentations at Sunday Church worship service. 5. Christmas: We celebrated Christmas at the “Kan Daw Gyi Park” (Big Royal Lake). The children sang Christmas songs as groups. We are inspired to hear that Naing Tam, 14 years old boy of BH 2, wrote a Christmas song in Burmese entitled Jesus Came for Our Sin. The song was sung by the three boys of BH 2: David Lal Tha Kim, Thang Khan Tual and Rang Lian Bawi while Naing Tam played the guitar. The leader of BH 2, Van Siang Mang also wrote a Christmas song entitled Precious Christmas and the women sang it. The children were very happy inspired to participate in the Christmas celebration. 6. Thankfulness: The children are very happy to be at the Bryce Homes. Some children are grown up physically and spiritually. They are so thankful to the individual sponsors and UTT for supporting food, clothes and shelters. 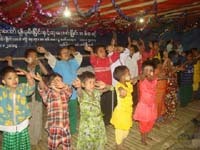 Their constant prayer is May the Lord continue to use UTT for the development of the children in Myanmar. I praise God for allowing us to be busy in sharing the Gospel of Christ at the time when Traditional Christmas season influenced even among Buddhist community. After coming back from a Gospel trip to Delta area with joy, without ceasing we take times in sharing the Gospel house to house. 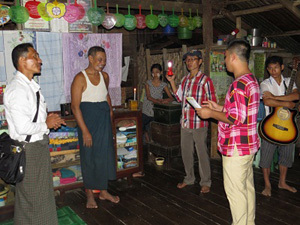 We take a carol singing as great privilege to distribute tracts and share the Gospel in Buddhist houses. At this time, they do not only open the door, they also pay their full attention to the purpose of Christ’s coming. This kind of ministry activities teach the students and Bryce Home children a lot. It gives the team to realize the great need of sharing the Gospel and not to be ashamed of the Gospel. December 29, Khuasik will gather the non Christians in his mission field and have Christmas for the purpose of sharing the good news. Some of Bryce Home Children and discipleship students will participate with that. December 30-31, we will have spiritual conference at Shwelinpan. We pray that all the people who come might be able to put off the old manners and walk in the newness of life in the new year 2013. Please pray with us too. I am privileged to give this report to you that the name of God be glorified on every side. 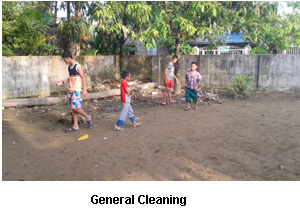 We had a mission trip to Myaungmya division for Eight days from 11 to 18, December, 2012. We, all the Making Disciples School family of 12 people, had departed out from Yangon towards Irrawaddy division by ship and we all were on the ship. We had distributed the gospel tracts to those on the ship. And we were divided into three groups. We are four in our group, Khua Sik, Habakkuk, Peter Donga and Stephen Win Tun. We arrived there at Pyinywa a sub-town at the shore and went to Natyua village and stayed in U Kyaw Tint's house a Buddhist. 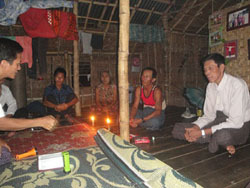 At the night Khua Sik firstly shared the Gospel to the father of U Kyaw Tint 91 years old, and Habakkuk also read I Tim. 2:4; John 3:16 and shared about man's life and God's love. I thank God that we could have such a privilege while all could not do in that house. We went to Eingtalung village where only very few Christians are there. As we were led by the a minister there we visited house to house sharing the saving knowledge of Jesus Christ. In that village there is a man a Buddhist but professes himself a Christian, he said that he has been a half Christian for more than ten years because all religions are good. But he claimed his desire to hear what we preached to his family. To me, the reason is for contextualization. Afternoon, we went to Kadetkui village where there are some Christians. The pastor Man Maw Ni warlmly welcome us to their church as they have newly reconstructed. Khua Sik preached at night service based on 2Cor. 5:17 and Peter and Stephen (Disciples' students) had shared their testimony and presented a special song. After service, we were invited to shared the Gospel at the Birthday service and Habakkuk preached and encouraged them with the Word base on Ps.127:4; Ezk.18:4. The people there very much enjoyed the fellowship we had with the Word of God. I hope, God willing, we can give them Biblical teachings in the coming year. Early morning we had visited house to house while we also distributed tracts. As they (Christians) are minority we have much concern for the people there as God opens the door. At noon, we went to Kuipyinsik where an uncle of Khua Sik lives. He is a very strong Buddhist who first rejected us to go to them. We could pray for him as he was sick and shared the Word. We visited to one of Khua Sik's aunties, sharing her all about salvation and after she provided us lunch we moved to Dupat Vilage. We stayed at U Win Hlain's house. We helped them planting some plants and carrying harvested paddy. And we shared to them the Gospel. 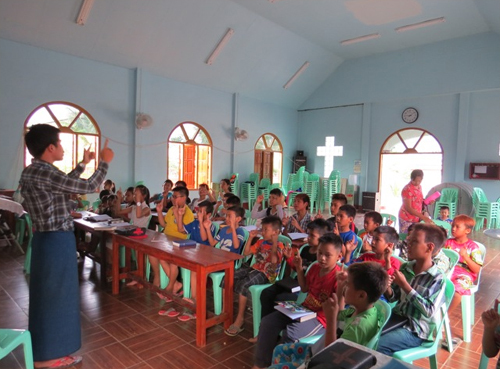 Habakkuk and Peter taught Sunday school children while Khua Sik and Stephen went to preach at a very poor family. As given chance at the sunday service at Phiapung Habakkuk preached from Titus 3:15 ( with Naman's life in Numbers). Evening we were invited to the Youth Fellowship service and Habakkuk exhorted them with the Word from Jer.9:23. We had teaching class; Khua Sik and Habakkuk taught to some of the elder ones. There is a great need for them a Sound Doctrine be taught because they all think they were saved by being a member of Christian community when they get water baptism. We continued teaching class. At night we went to some houses sharing about salvation by grace alone. We return and safely arrived Yangon. Again I would like to thank God and praise His name for allowing us to participate in the ministry which every one could not and did not want to do. I hope God will open the door for us to take part in this ministry more in the future so that we can be a useful instrument for His name sake in this short life. I herewith attached some of our photos that you can remember in your prayers. for standing along side with us in His mission. strengthen us to claim a victory wherever we go. We distributed so many Gospel tracts written by bro. Rama. We share the Gospel house to house. We gather if the situation permits. In some villages we are given permission to share the Gospel to the children at Government schools. In some places we organize and encourage them to have regular fellowship each others with the Words. We want to keep in touch with them because these are the best way we know how to reach Buddhist villages. Since the mixed culture with religious, we still need to take some more times and strong commitment. These are all because of your financial support and prayers. The other group report will be given by Habakkuk and Thar New. There are 14 children in Bryce Home 4. Andrew-a director, his wife and his sister in law are the carertakers. Most of the children are from the very poor and Animist family background. Monday to Friday they go to school. Night time, they have regular prayer meeting. In the week end, Andrew always bring them to the villages to reach people with the Gospel. There is a great hope to extent God's kingdom through these children in those remote villages. Thank you for your financial support for food, education, clothes, and an additional building which will last for life. Greetings from Bryce Home One and Two in the precious name of our Lord and Savior Jesus Christ. to greet the Education Minister. I beg your pardon and understanding. I send a report of Bryce Home One and Two. May the Lord richly bless you to bless the children. I am please to share you the faithful leading hand of God which we experienced through out the years. The children situation before they came to Bryce Home 3 was so different from today. They were without being cared and without education because their parents are unlearned. They didn’t have enough food to eat. They were struggling for their daily food. They didn't care and discipline their children. Their societies ate them up badly not to have hope for the future. Most of them have no knowledge of grace and thanks, very easy to speak ill of others, qualified enough in pretending and quarreling. In order to train these children to be like normal people and to equip them spiritually, educationally, mentally, it requires deep impression and long time commitment. with medicines for her body and with the Word of God. So, now she can read and write. She is fond of singing and she memorized hundreds of Gospel songs and Bible verses. Now, she becomes a faithful teacher of the outskirt children. We believe God has a plan and purpose through each child. So, we are deeply grateful to all who get involved to support Myanmar Ministries. Greetings in His name. I hope you are doing well in the ministry. I thank God and praise His name for His never failing love that allows me to care for the poor children with the sponsorship of UTT. It is not what we (parents) do but God does it. Below is an update of the Bryce Lodge Five family, in Yangon. Bryce Lodge Five family consists thirteen in number altogether. Tun Tun Aung was expelled out and taken back home by his father. Because he kept stealing even after being warned and chastised for times with the word of God. His father also came and chastised him once but still continued stealing money. Finally, as last decision I have expelled him after he has finished his school course. I should have forgiven him for any other kinds of characters but stealing cannot be tolerated. For this case I recognized that it was God’s hand to chastise them as the whole family, because his father also secretly came and stayed in Yangon doing an illegal business knowingly of it’s danger. It was two weeks after he took back Tun Tun Aung that he (the father) was caught by the customs and put into prison for 15 years. Please pray for him that they all repent to God and released some day. Mang San Lal, was also taken back by his father (my own brother) as he is the youngest of his four sons, parents long to have him being with them and they asked me. Myo Naing, a boy of 11 years old, a fatherless (father dead) has been entrusted to our family by one missionary who works as a missionary there in Magwe division. His mother has already been a Christian since before her husband died as a Buddhist. I have attached the picture of Myo Naing. All our children have passed their final examinations and therefore, Sai Ceu and Ruth have transferred to the middle school to sit in Grade Six. And we are in the process of their school admissions. Esther (helper) sister of my wife has left for her further study (M.Div). Therefore, we are looking for another helper. We could have an evening prayer meeting every night at 6-7:00. We are going to complete getting by heart of the whole book of the Bible (from Genesis to Revelation) by this month from every key verse. Please continue to uphold us in your prayers with a deep concern for spiritual growth that Bl. 5 family become a useful instrument of God for His kingdom sake. I will write to you again about financial expenditure of our family (Bryce Lodge Five) by the end of June, or I don't know if you want me to do that earlier. We also pray for God abundant blessings upon you and all donors for UTT ministry.Thank you very much for your love and concern. 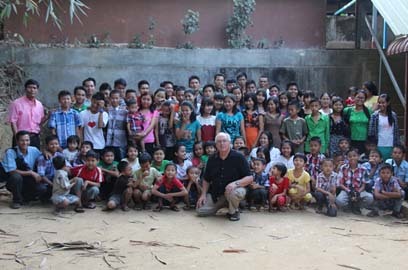 During our visit to Yangon, Myanmar in February of 2012, we were able to gather Bryce Lodges 1, 2, 3, and 5 together in one place for a time of fellowship and worship. The children sang a number of hymns and choruses that we were able to record on video. We have edited together some of these songs and posted them to our YouTube Channel. If you take the time to listen to this short video, you will be able to experience the great blessing we experienced as we listened to and watched the children. Greetings in His holy name. I hope you are in a good health and doing well of the ministry God has burdened upon your shoulders for His glory. God is good that He allowed us to get involved into the ministry this time also. Therefore please bear with me to give our ministry update. Day 1 & 2 (5/5/12) we left Yangon from 8:00 am by bus towards Kyauhtaw for 28 hours in the bus and reached there at 11:00 am (6/5/12). Day 3 (7/5/12) we continued our journey from 8:00am by boat, and we slept in the village on the way due to the problem with the boat. Day 4 (8/5/12) we continued to go by another boat to Semi (Paletwa sub-town) and we slept there in Semi, and some of Sen Thang villagers came to pick us up. Day 5 (9/5/12) by 5:00 am, we started to walk on foot and reached to Sen Thang village by 5:30 pm which is our trip destination. 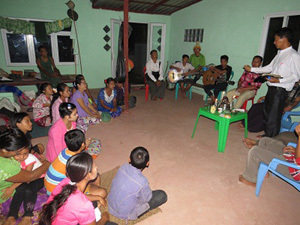 In the evening we had prayer meeting at the house of pastor Paung Than. From Thursday to Saturday (10-12 May) we had teaching classes from 8 am to 2 pm everyday as the schedule mentioned here below. Day 6, # Thursday morning Khua Sik taught about Salvation. Afternoon, Thar New taught about Signs for the Last Days. At evening worship service Habakkuk preached from Acts 3:1-11 on Man’s Spiritual Condition. Day 7, # Friday morning Habakkuk taught about the Pattern of the New Testament Local Church. Afternoon Khua Sik taught about Christ work of Justification. At evening worship service Thar New preached about God’s Deliverance from Sin and it’s Power. Day 8, # Saturday morning Thar New taught about Christian Life.Afternoon Habakkuk taught about Biblical Separation for the True Church. At evening worship service Khua Sik preached on the Newness of life from 2Cor. 5:17. Day 9, Sunday morning from 9 to 11:30 the new church building dedication service was held. Afternoon we spent time for house to house visits. And a dinner party was joyfully held as the father of pastor Paung Than offered pig for Church dedication. Evening worship service Khua Sik preached from Matt. 24. Day 10 to 14 (May 14-18) Return back to Yangon. We arrived back at home safely. 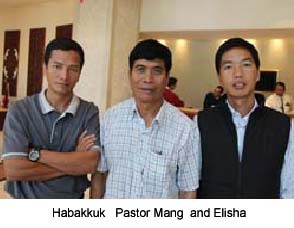 -Pastor Paung Than and helpers as church leaders. -Youth leader, women leader and Sunday school teacher/children and all members that they might be blessed and become a good example around those areas in the ministry. -The church committee has decided to send out one missionary by name Mr. Kawh Ma one of the youth leaders and who had first contacted us for this program with pastor Paung Than. He is a graduate from YGBS of Philip. He is prepared for evangelizing in Paletwa the township of their people. - Mr. Mg High one of the youth leaders is going to transfer from YGBS to another Bible school for the vision they have in the ministry for future. We enjoyed to see the people of God establishing the local church at Sen Thang village which is called Kaehkung Church (in referring to the place name). There are 15 houses in the village which consists 82 members. I herewith attached some pictures below. I hope you can please pray with us for God’s people there that God would use them to extend His kingdom not man’s and some animists would come to the saving knowledge of Jesus Christ. Ministering to them with the Word of God requires much and therefore many ministers would not do that. Thank you for your help in all ways for His name sake. God bless.